I’ve been promising this one for quite some time and it is finally here! 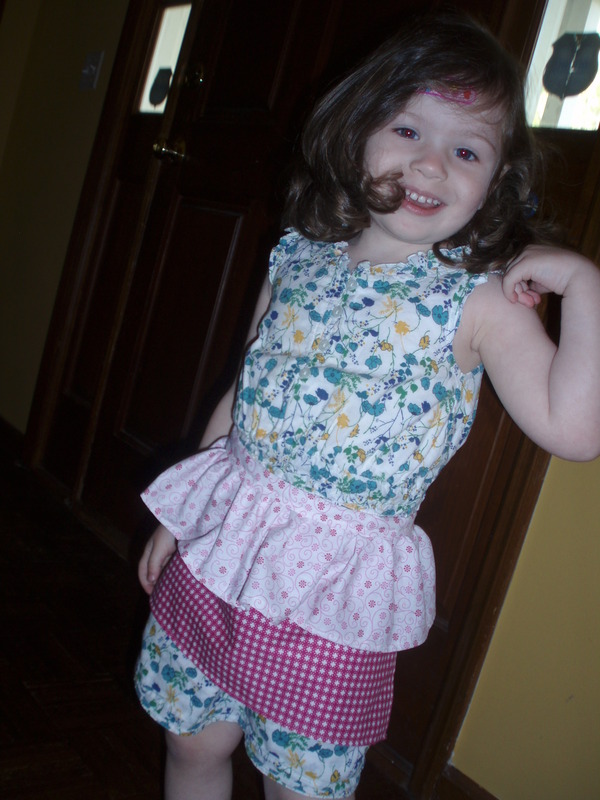 Say hello to my toddler/preschooler hoarding apron pattern tutorial!My hoarding apron is perfect for preschoolers and toddler who seem to think they must carry all their stuff at one time. 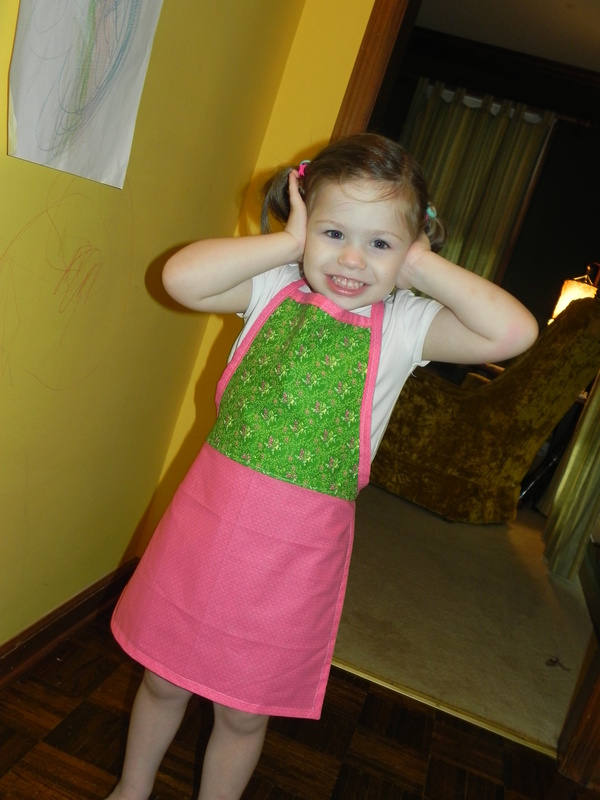 (Why they can’t play kitchen without every pot and pan on their person is beyond me.) 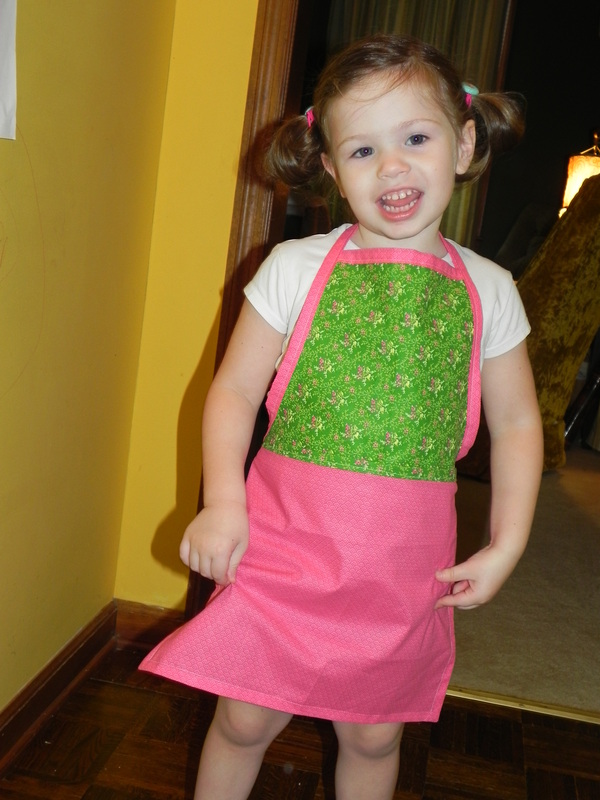 This apron is unisex and makes an awesome gift. 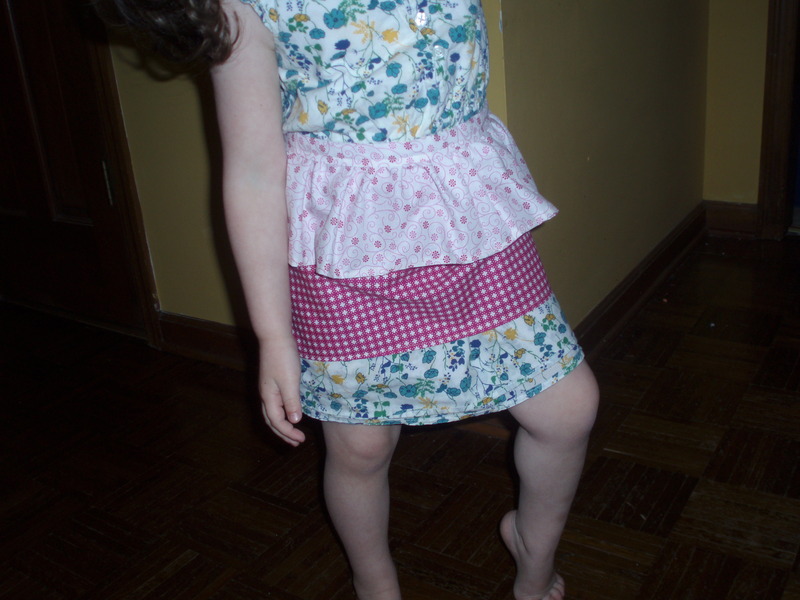 It is easy (if you can get past the complicated directions) and uses only 2 fat quarters of fabric. (Also known as half a yard.) 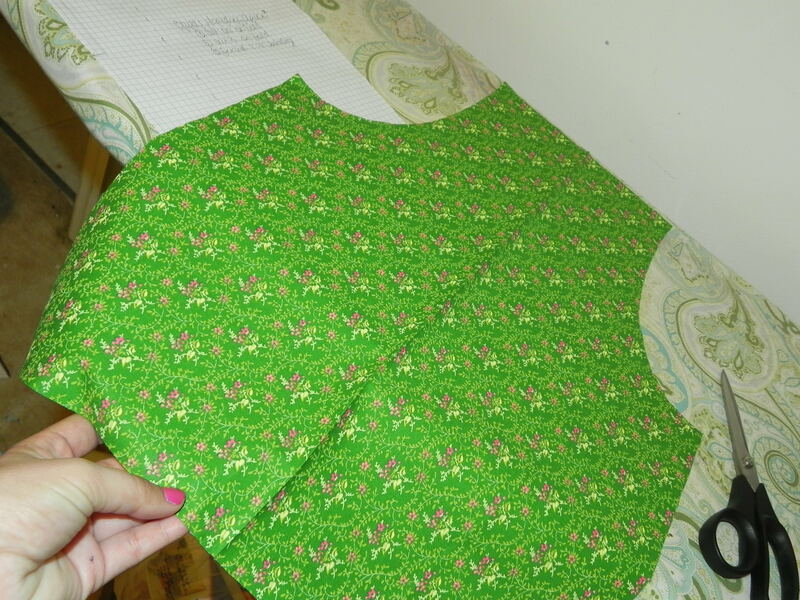 You’ll be drafting a pattern for this one, so get ready for a long tutorial! 1. 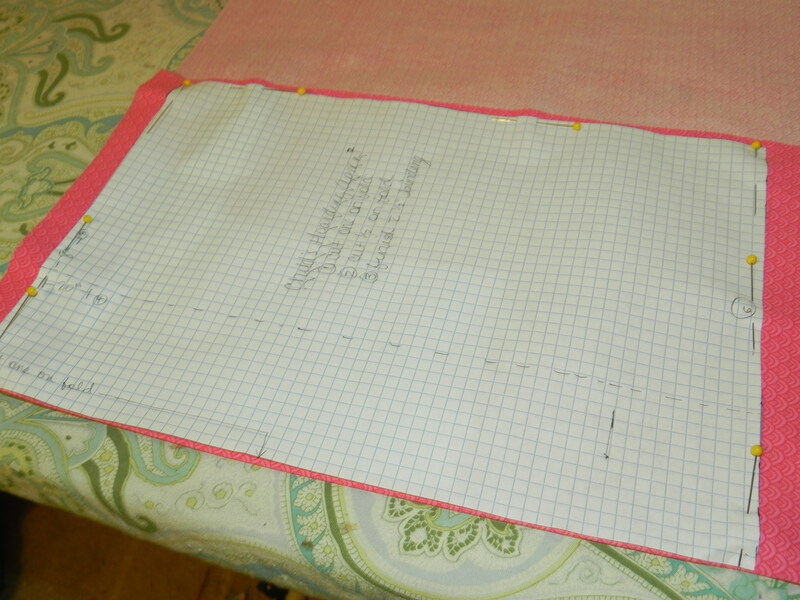 At the top of the paper, measure 4″ in from the edge. 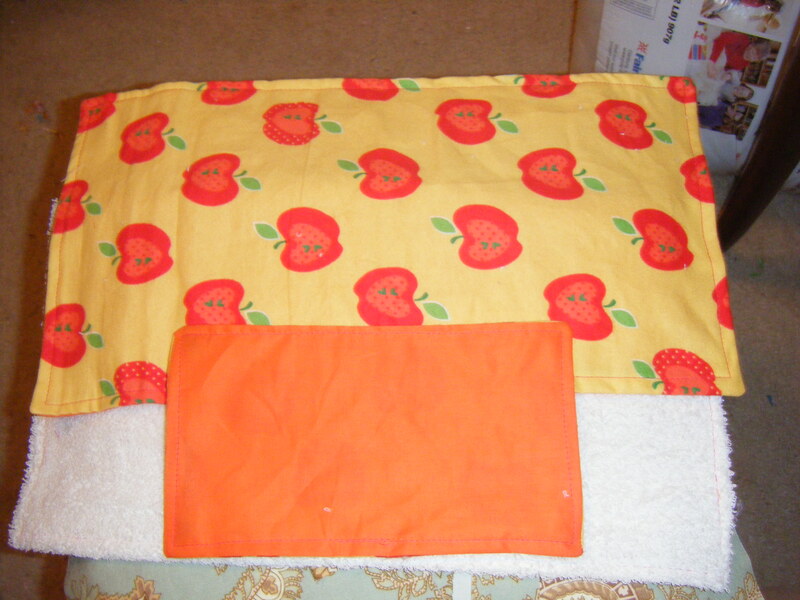 This will be the top of the apron. 2. 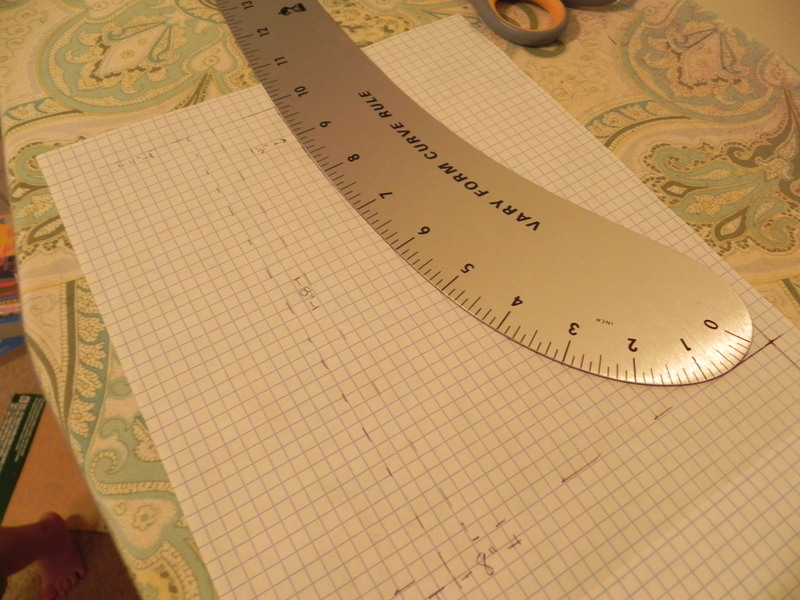 Measure 8″ down from the top line. Mark it. 3. Across the 8″ down mark, measure 8″ in from the edge. This line will be parallel to the top line. This is the “hip” line. 4. 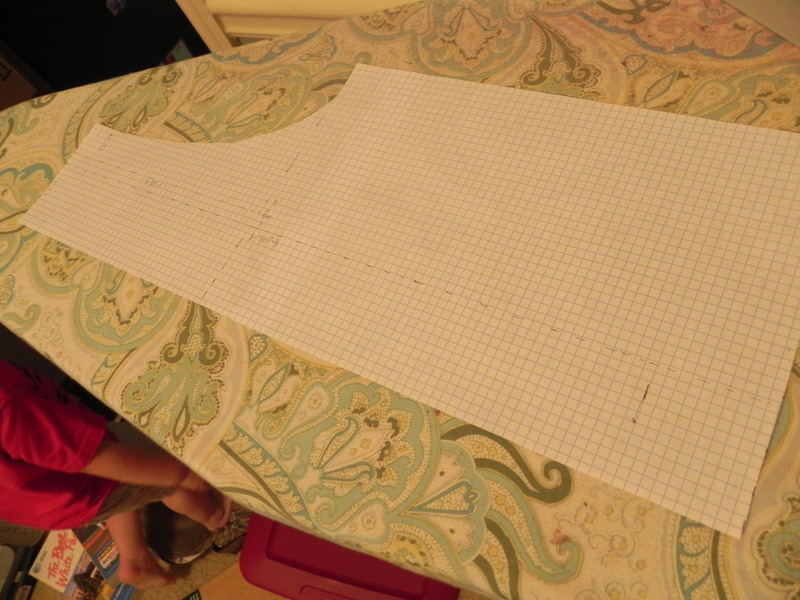 Measure down 20″ from the top line. Mark it. 5. 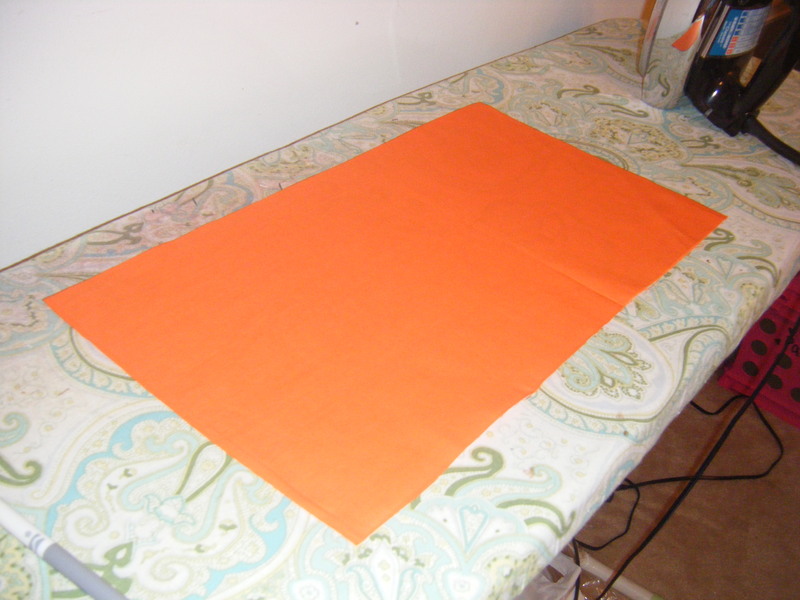 Across the 20″ down mark, measure 8″ in from the edge. This line will be parallel to the hip line and the top line. 6. Connect the two 8″ lines. 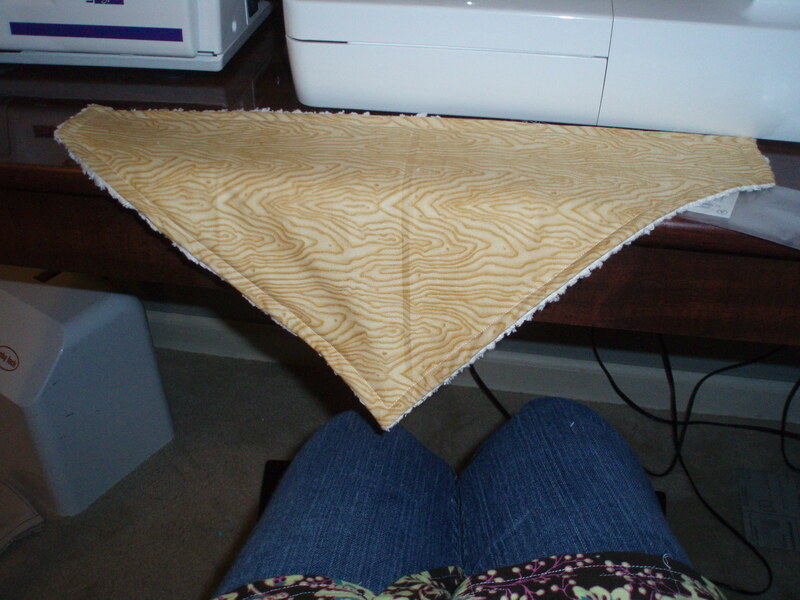 This will be the bottom side of the apron. 7. 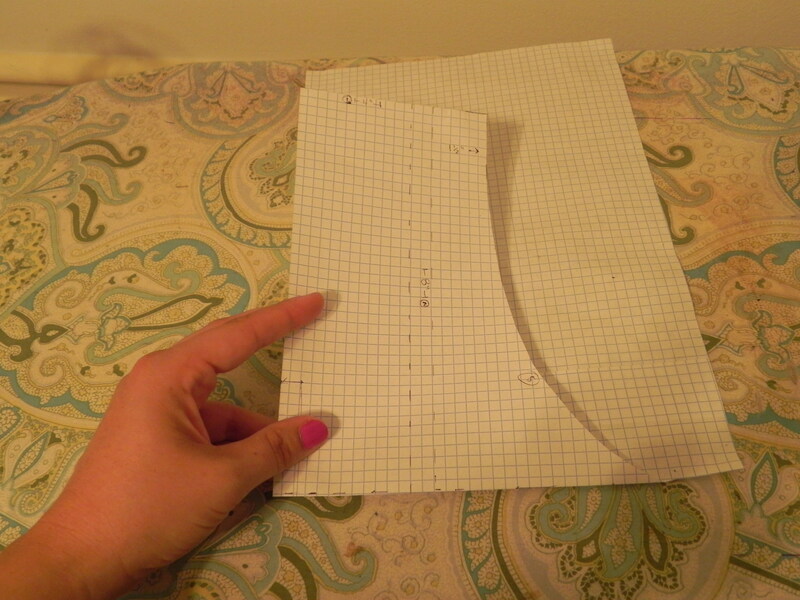 Draw a line 2″ down from the top 4″ line, squaring the corner. 8. 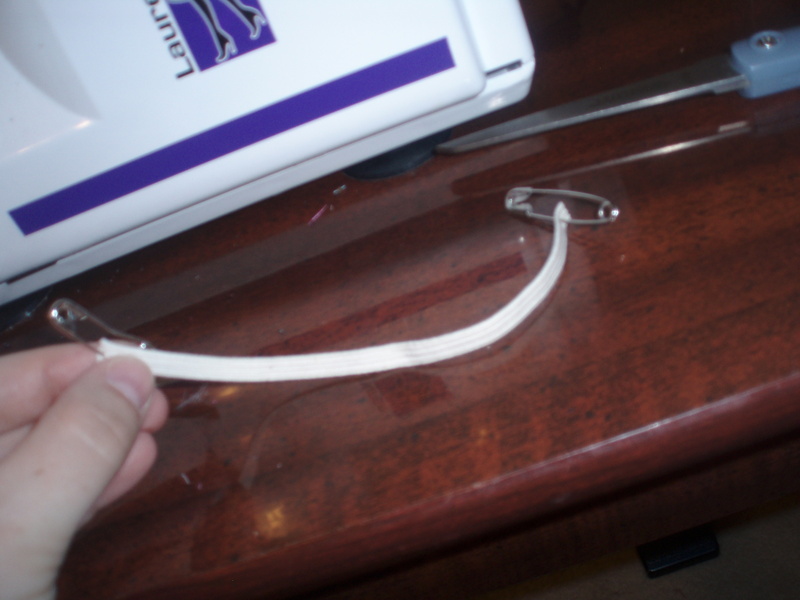 Connect the 2″ line to the edge of the hip line. 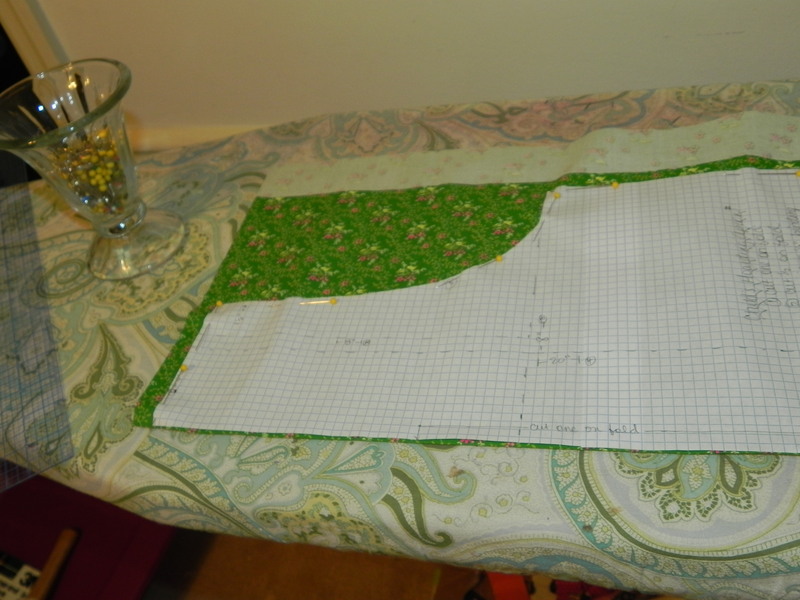 I use my variform curve ruler for this, moving it around until it looks right. Look at your pattern you’ve drawn, decide if it looks right. Chances are, if it looks okay, you’ll be fine. Make sure your corners are squared. And cut it out. 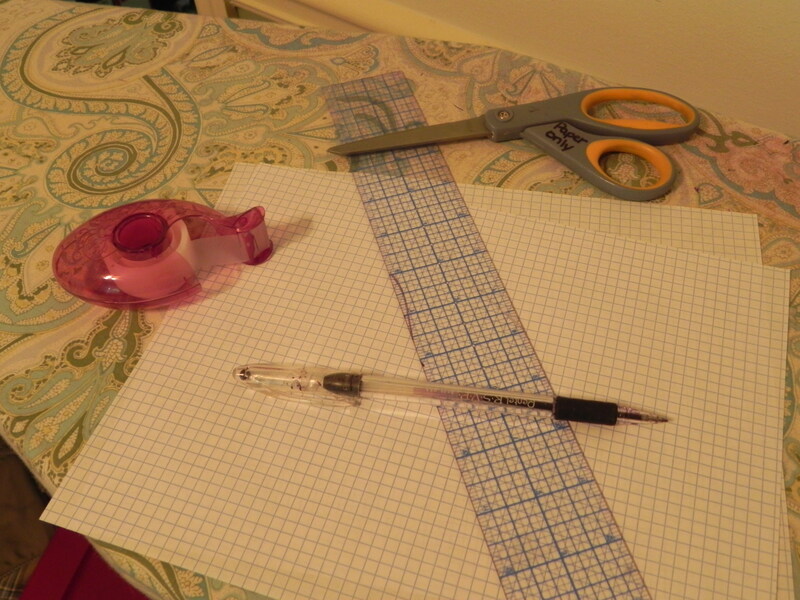 Make sure you mark everything on your pattern. 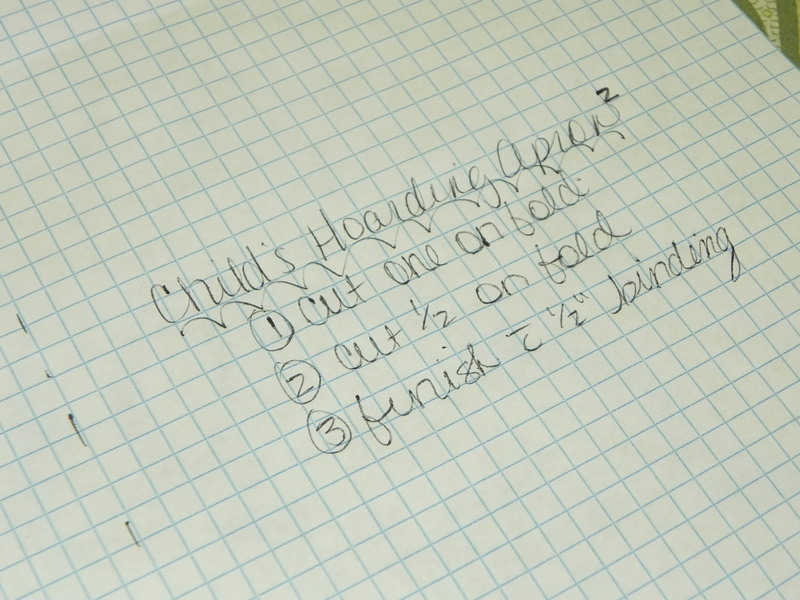 You may remember when you make the pattern, but by the third or fourth time you pull it out, you’ll have no clue what all your markings mean. 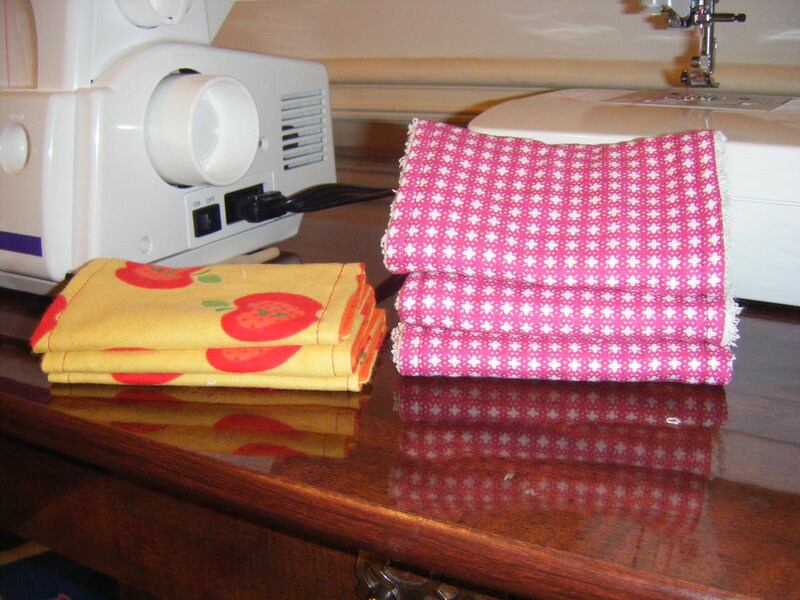 For the sewing portion of this program, you’ll need two fat quarters. 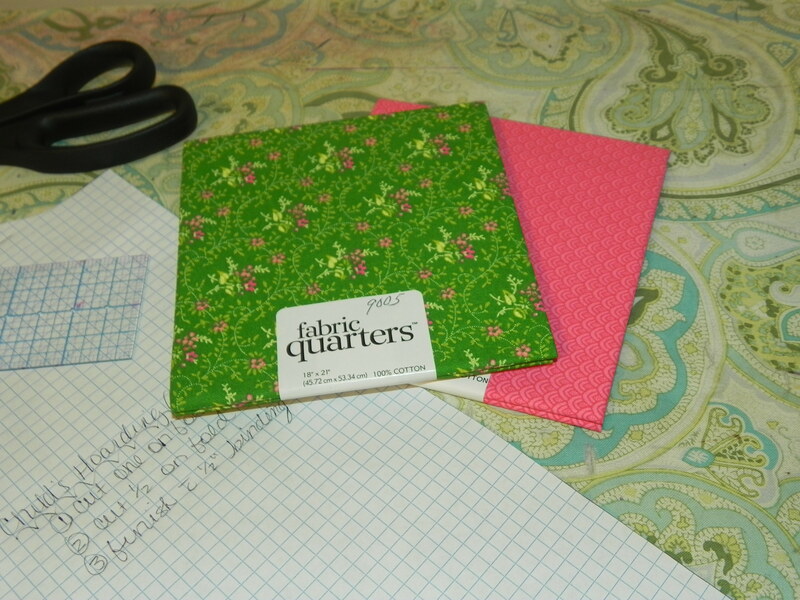 Yep, you’ll only need two fat quarters. 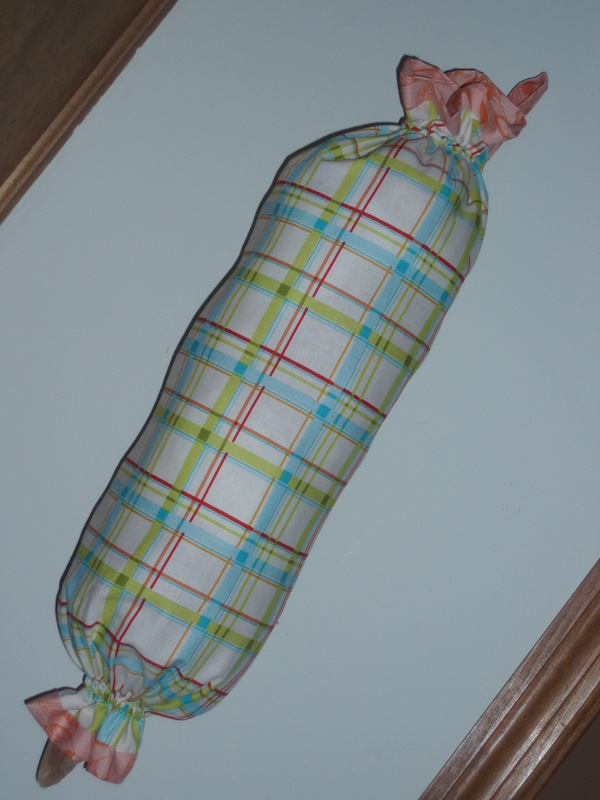 You could also buy half a yard of fabric, if you’d prefer. 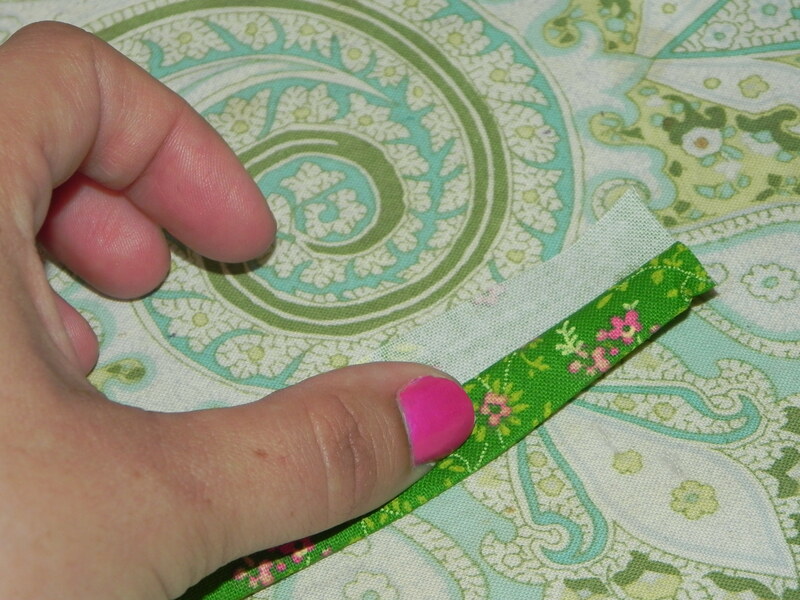 Pin your pattern onto your fabric with the edge of your pattern on the fold of your fabric. 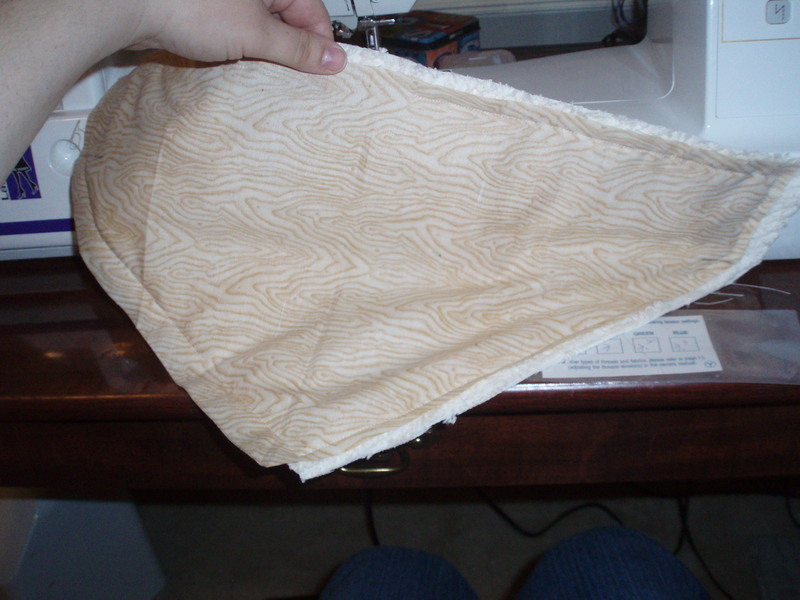 I don’t fold my fabric in the center, I fold it as far to the edge as I can, while still being able to fit the pattern. 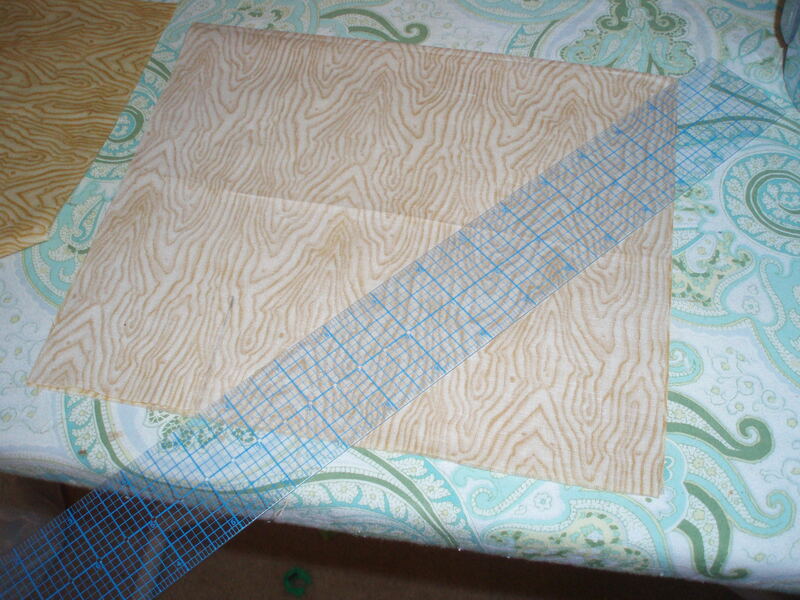 You’ll want nice scraps to make strips for the binding, so try to fit the pattern on there the best you can. 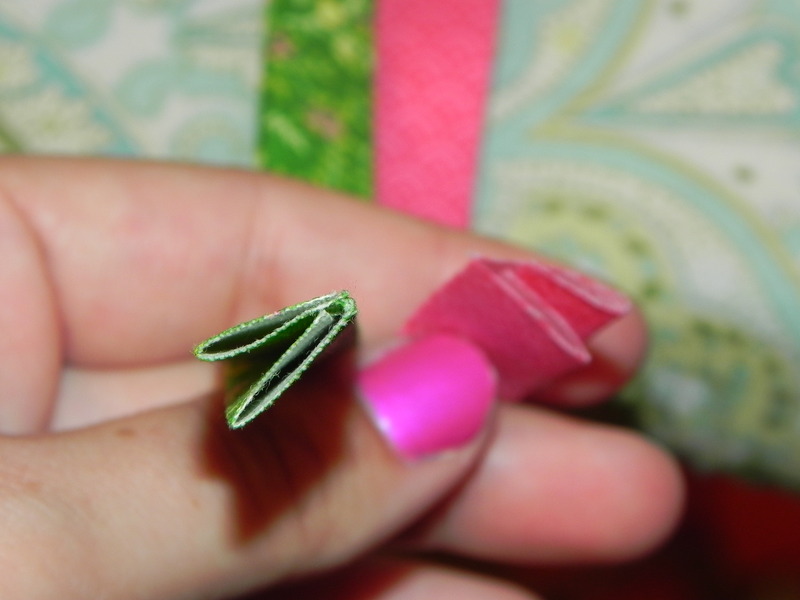 This is what it will look like unfolded. 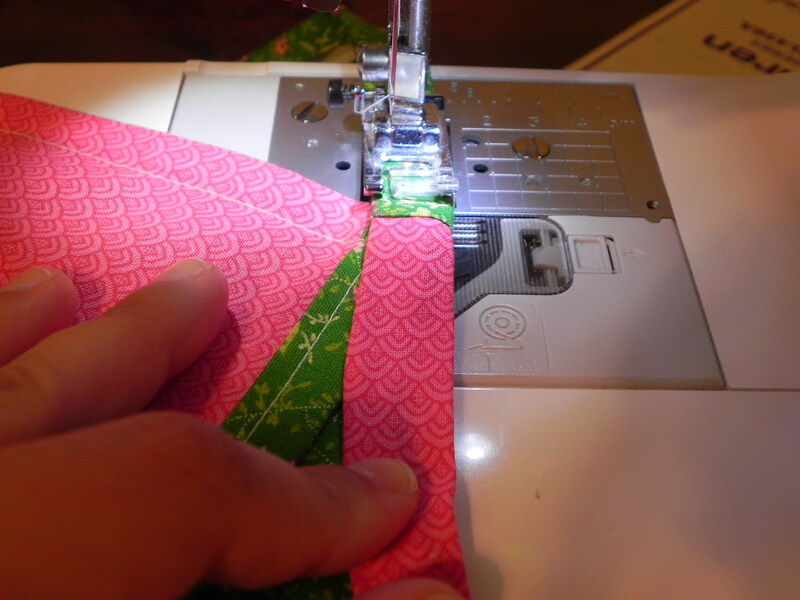 Fold your pattern in half along the hip line. 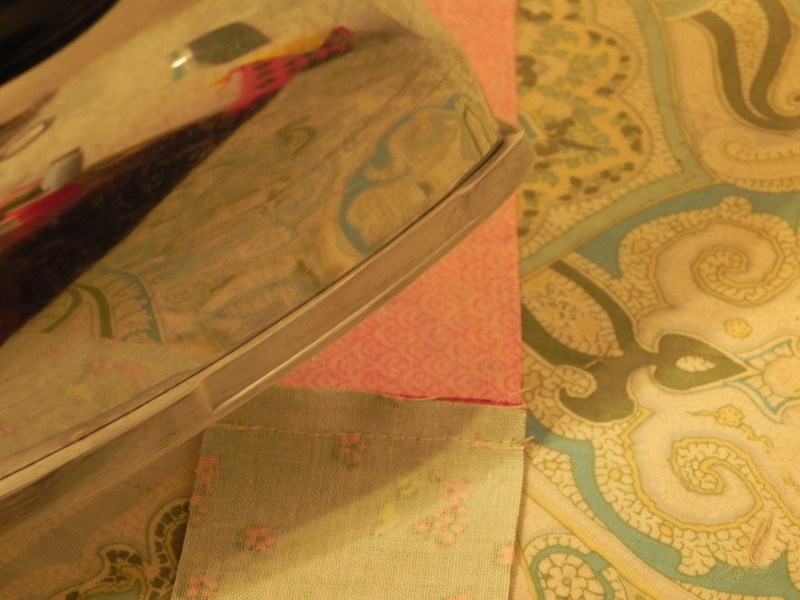 You’ll use the bottom half of your pattern to make your hoarding pocket. 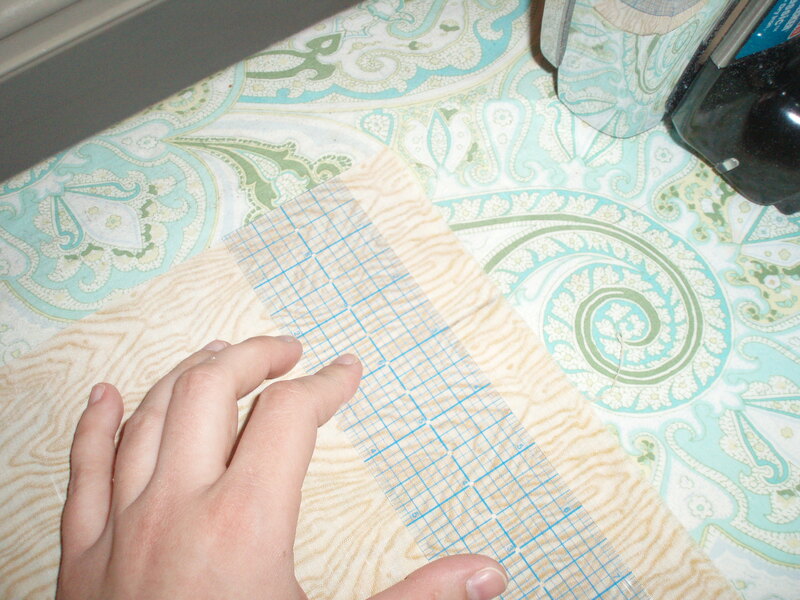 Now, cut as many 2″ strips of fabric as you can. 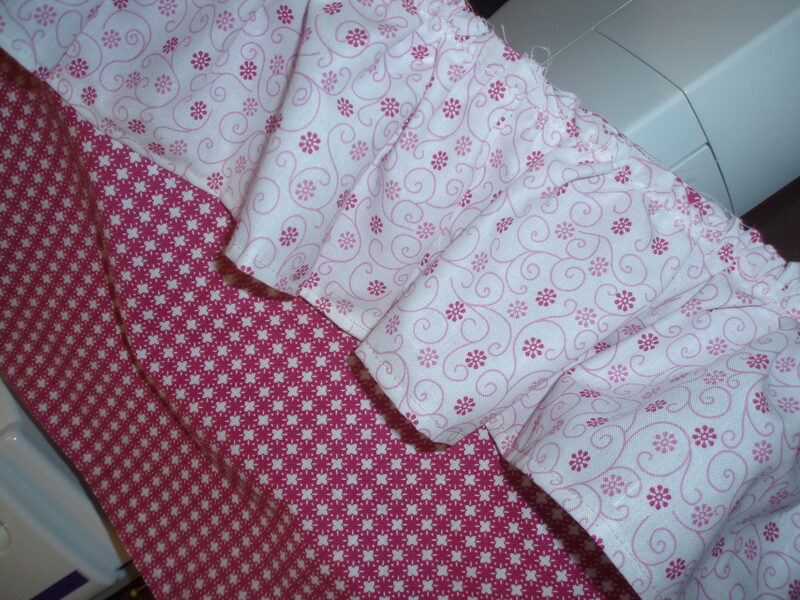 This will be the binding for the apron. 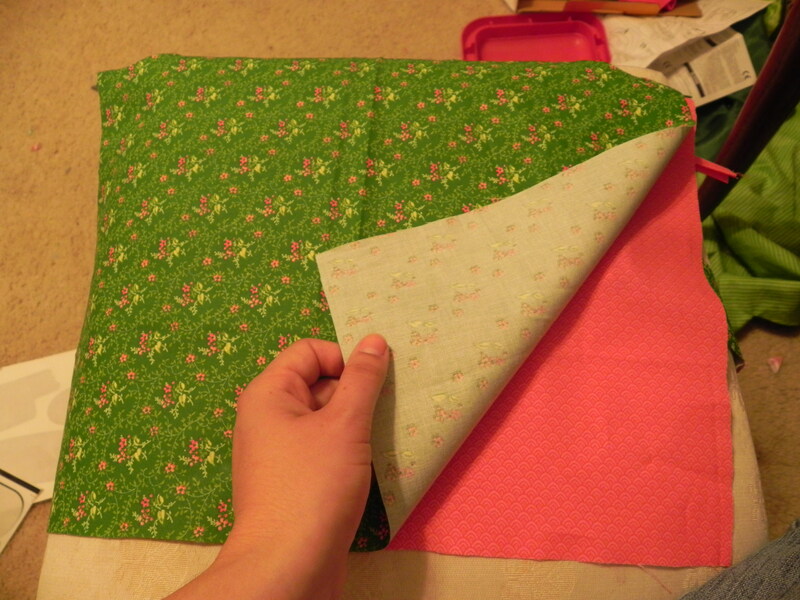 If you despise making binding, you can always buy double fold bias tape if you want to short-cut it. 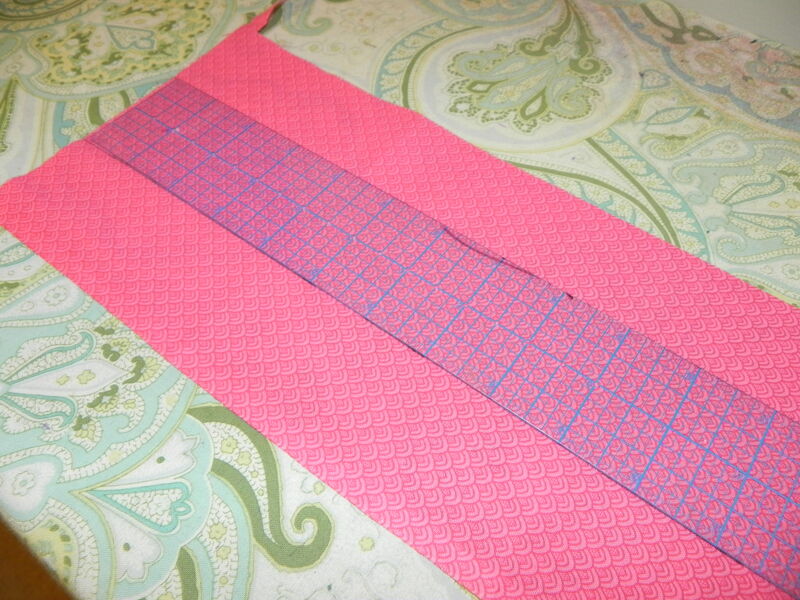 I was able to cut 5 strips from my contrast fabric (the pink) that were 2″ wide and about 18.5″ long. 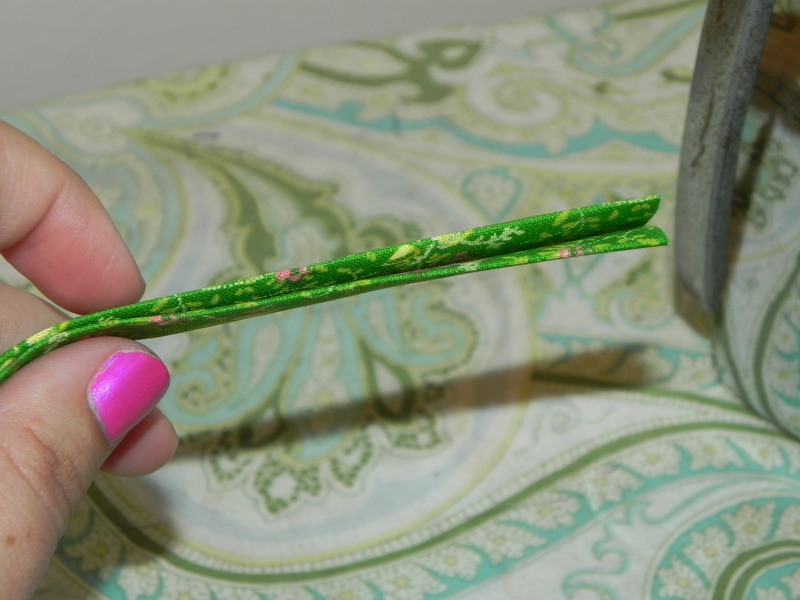 From the green, I got one strip that was 2″ by 21″, one that was 2″ by 4.75″, and two strips that were 2″ by 8.25″. 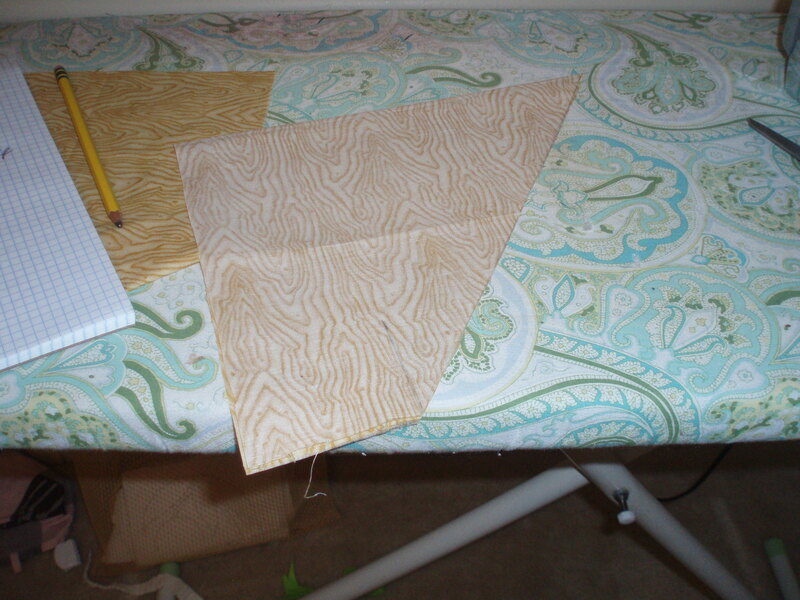 Take two of the longer strips and go ahead and make them into binding. (I used one of each color.) 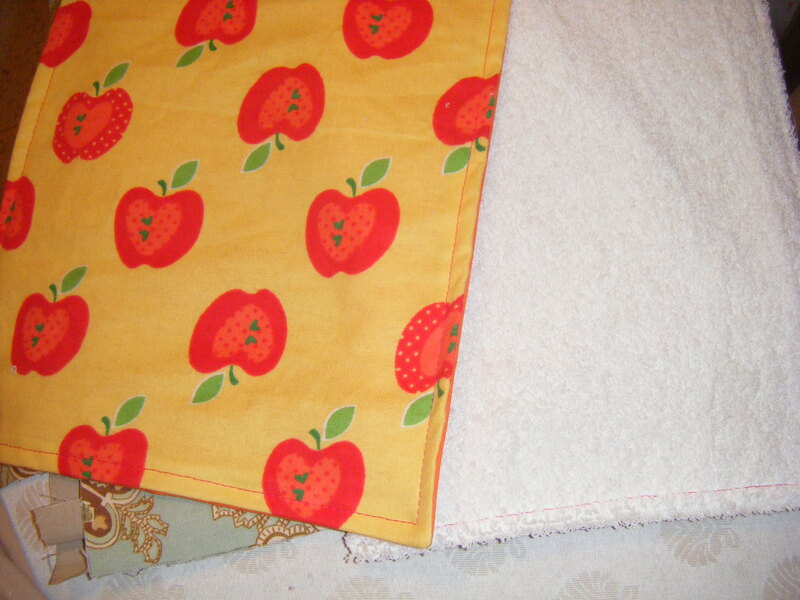 These are for the top of the pocket and the top of the apron. 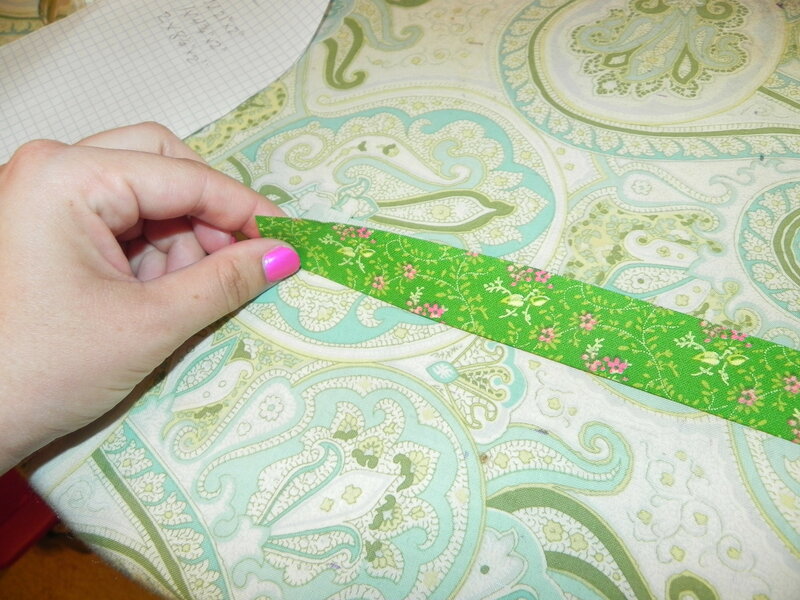 The rest of the strips will be sen together and made into one long strip. 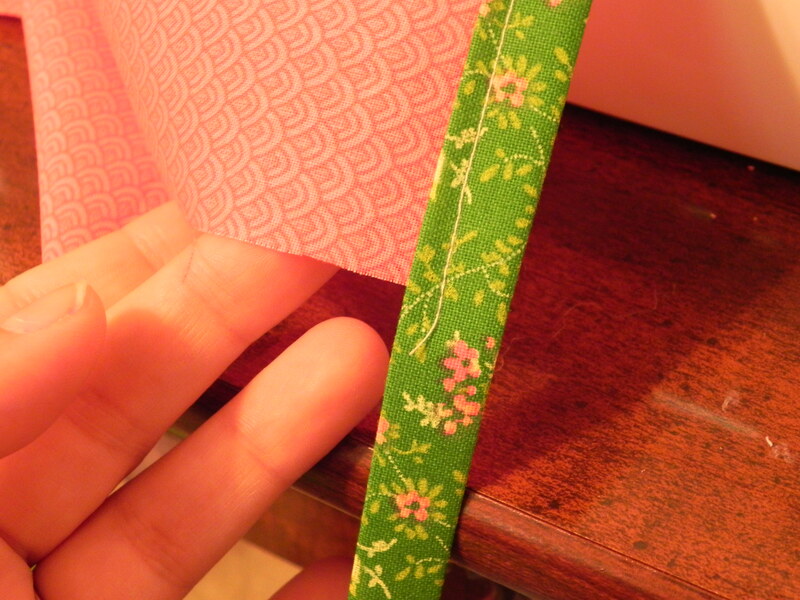 To make binding- Fold and press the 2″ strip in half. 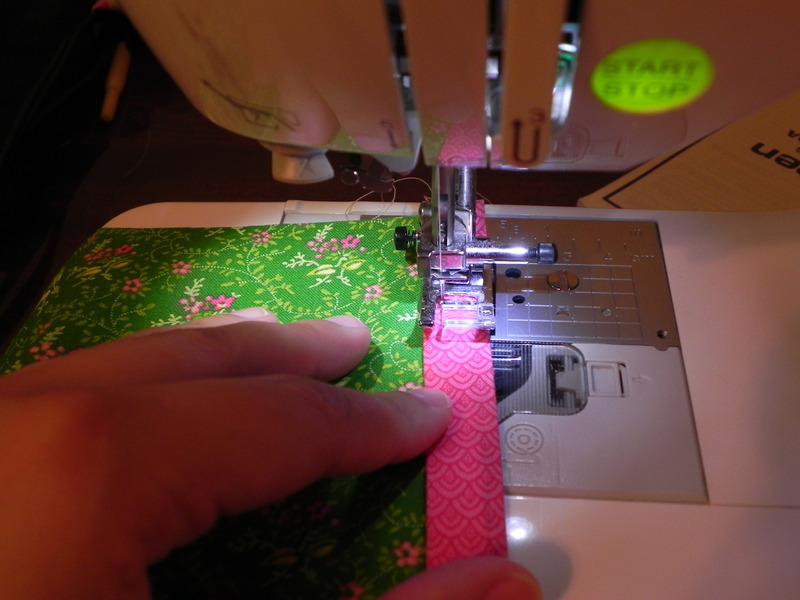 Now you’re going to tuck one edge in toward the center and press. 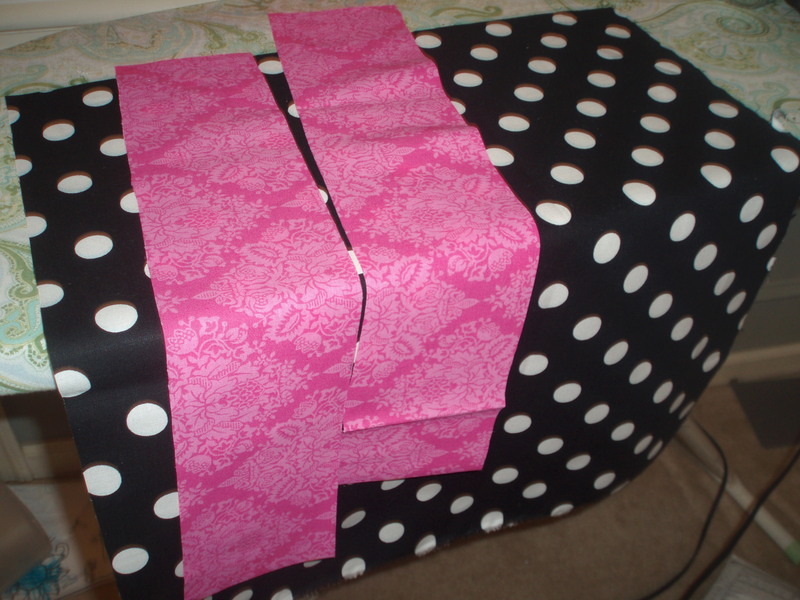 Tuck the other edge up into the center, too, and press. 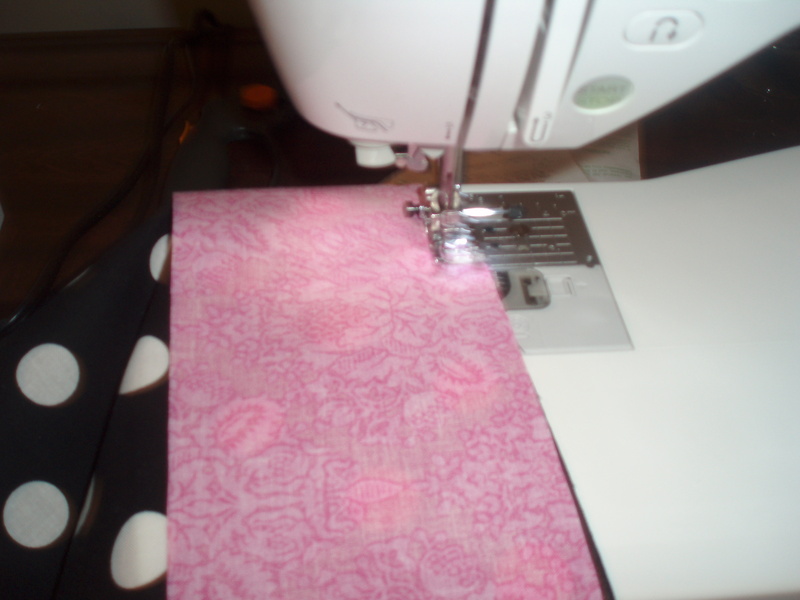 Now, you have binding! Ta-de-dah! 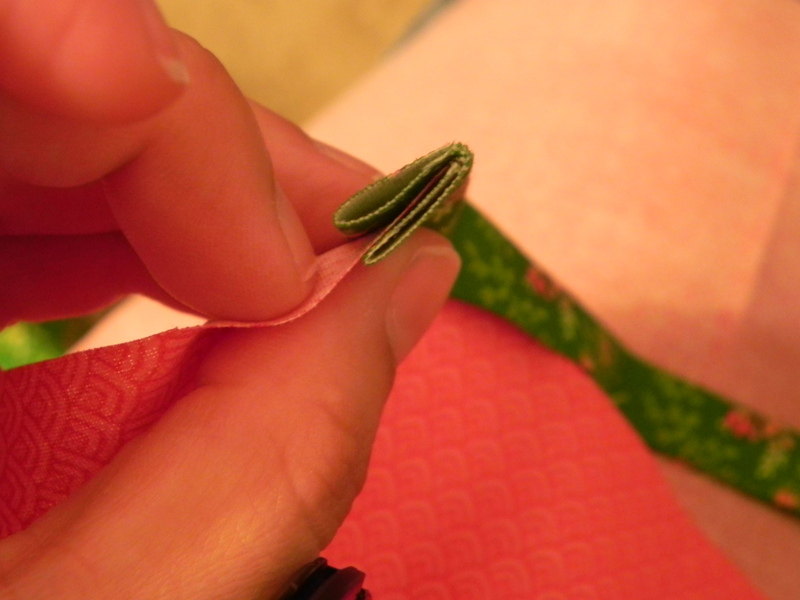 Now, sew the binding onto the top of the pocket. 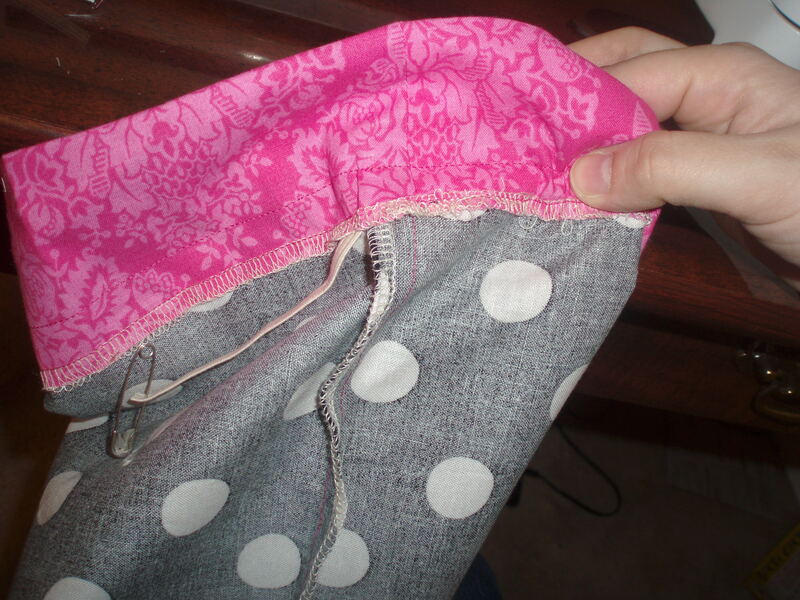 Just sandwich the fabric of the pocket between the binding. 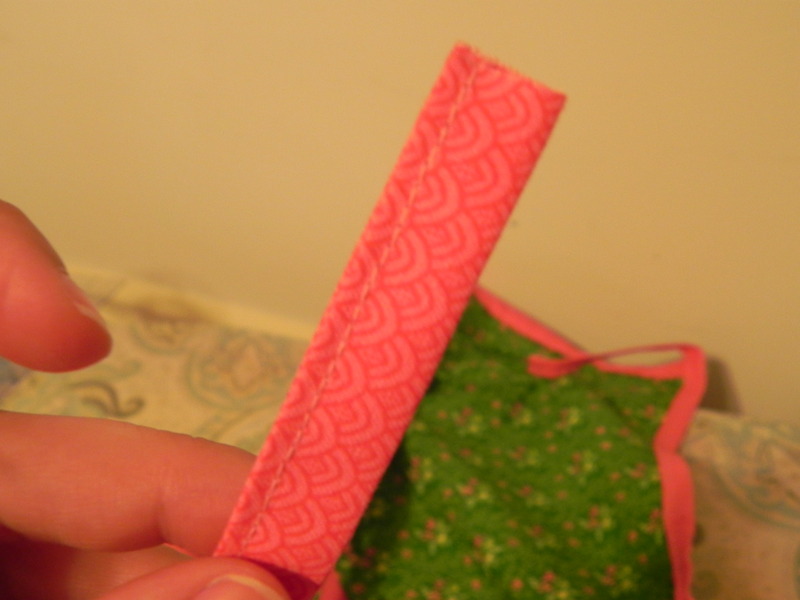 Sew along the edge of the binding to attach it to the top of the pocket. 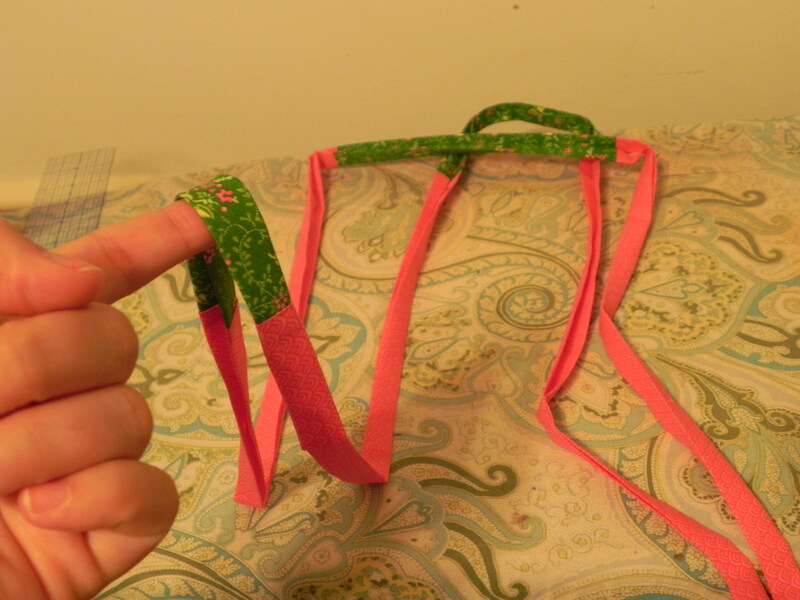 You’ll have too much of the binding and that is okay. 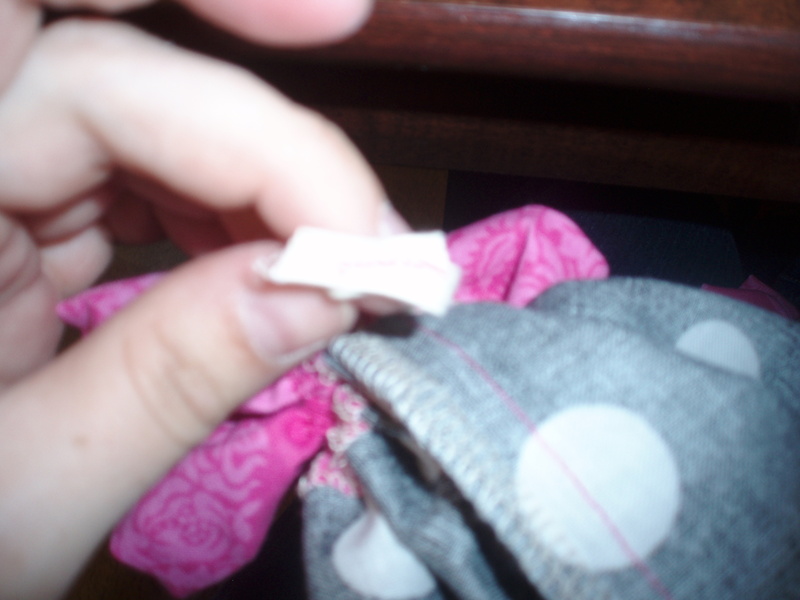 Just sew to the edge of the fabric and cut the excess binding off. 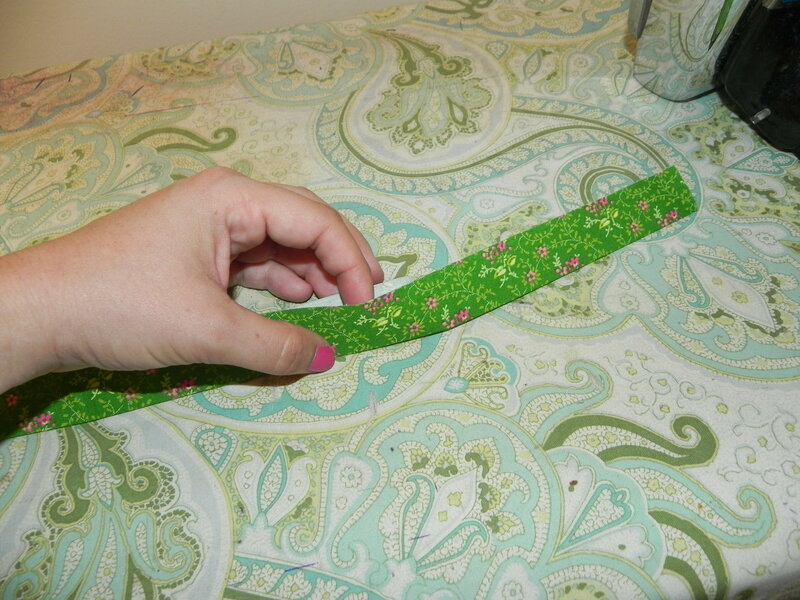 If you are short on binding in general, you can sew the scrap into the rest of the big strip if you want. 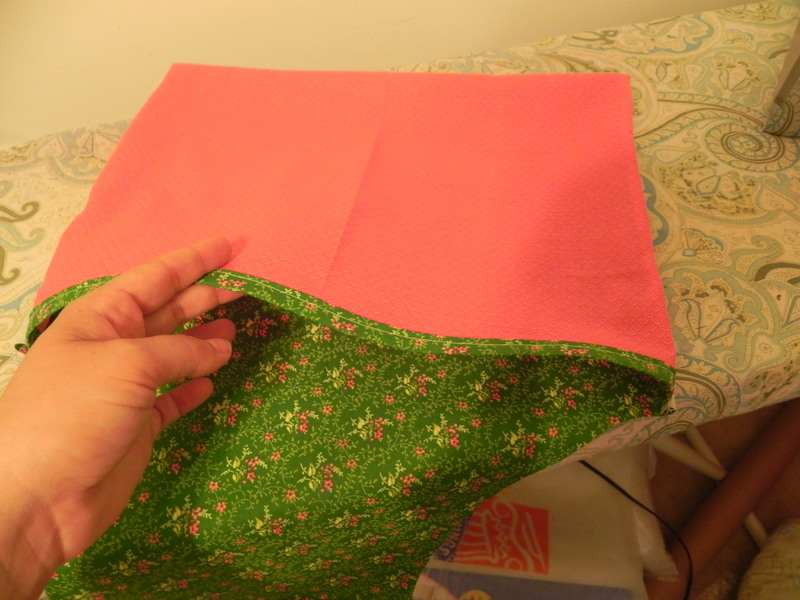 Attach your other piece of binding to the top of the apron. Do it the same way as before. And like before it will be too long and you’ll just cut the excess. 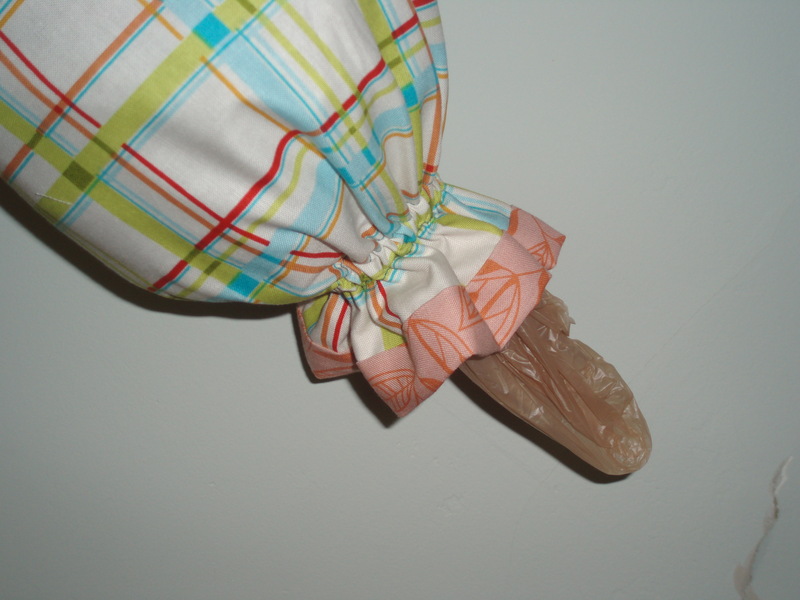 Now, you’re going to attach the pocket. 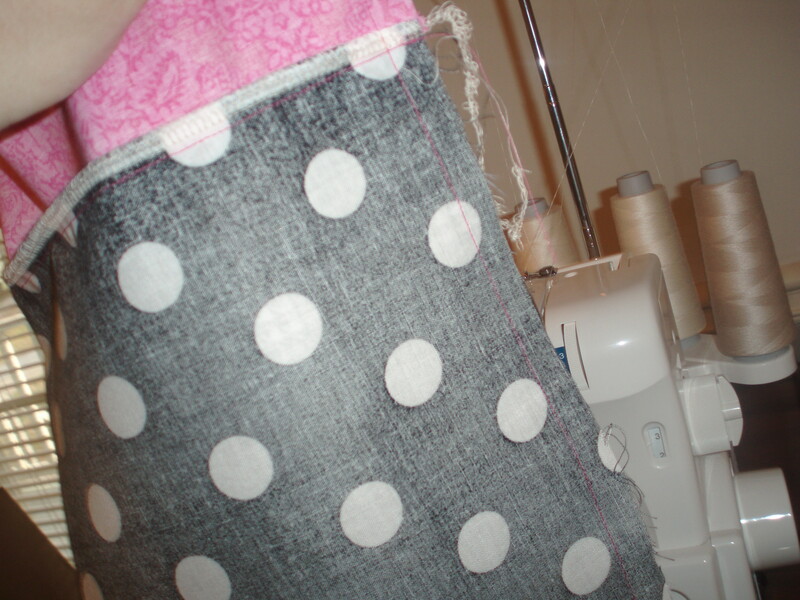 Lay the pocket behind the apron body. 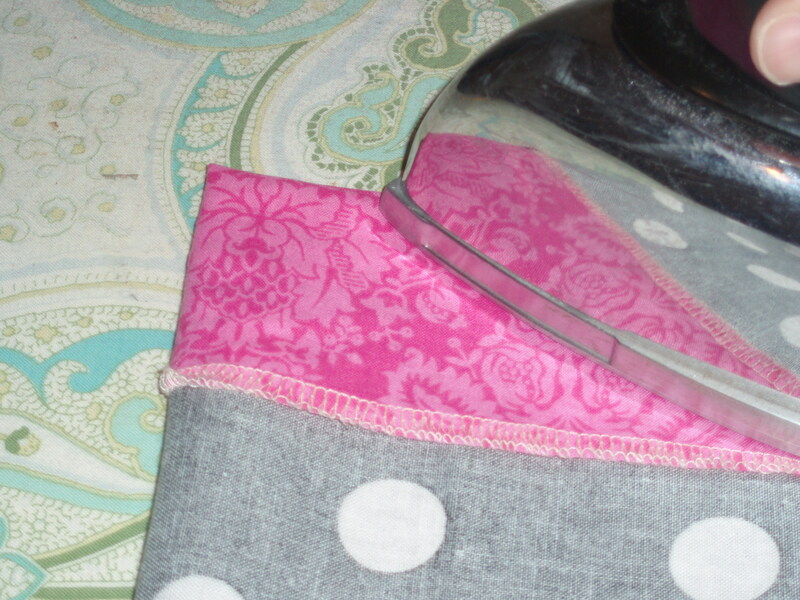 You’ll want the right side of the pocket facing the wrong side of the apron body. 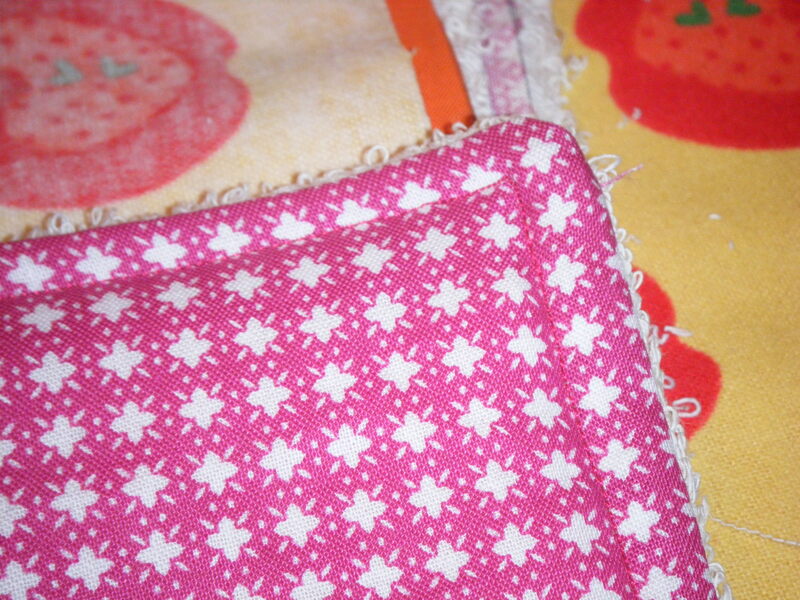 Sew around the edge, using about 1/4″ stitch. 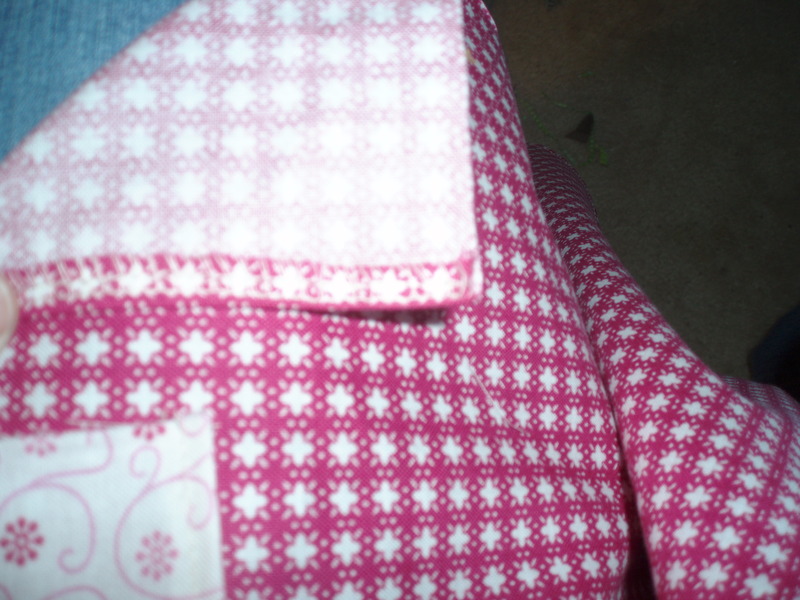 Flip the pocket right side out and press. 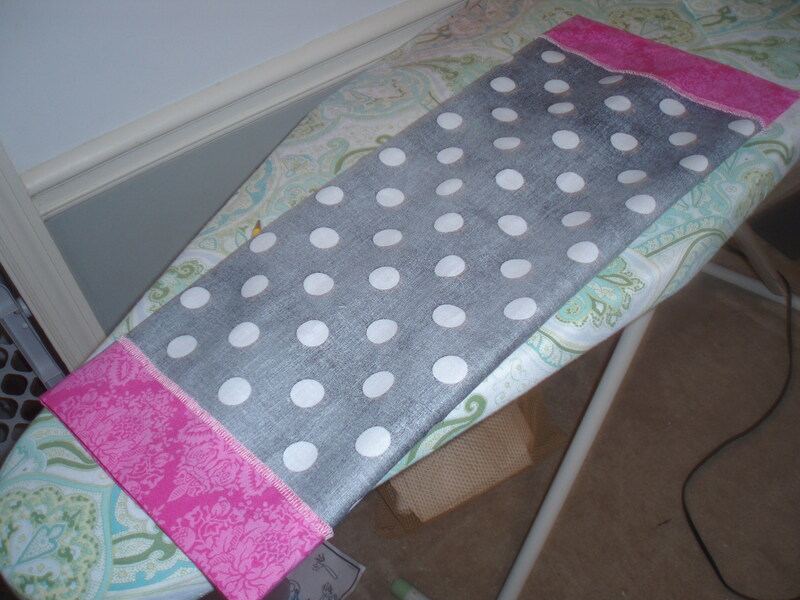 Sew all the rest of your 2″ strips together. You can arrange them in any way you would like. 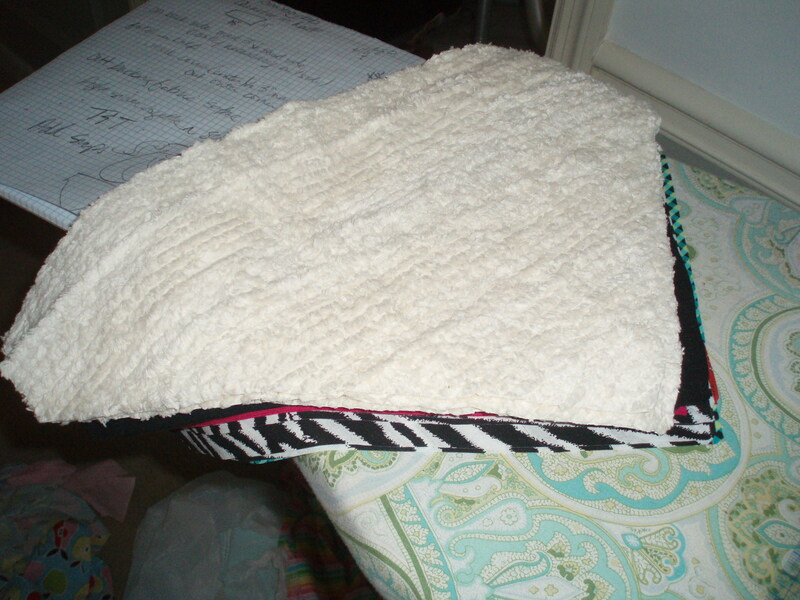 Just put right sides together and sew them end to end. 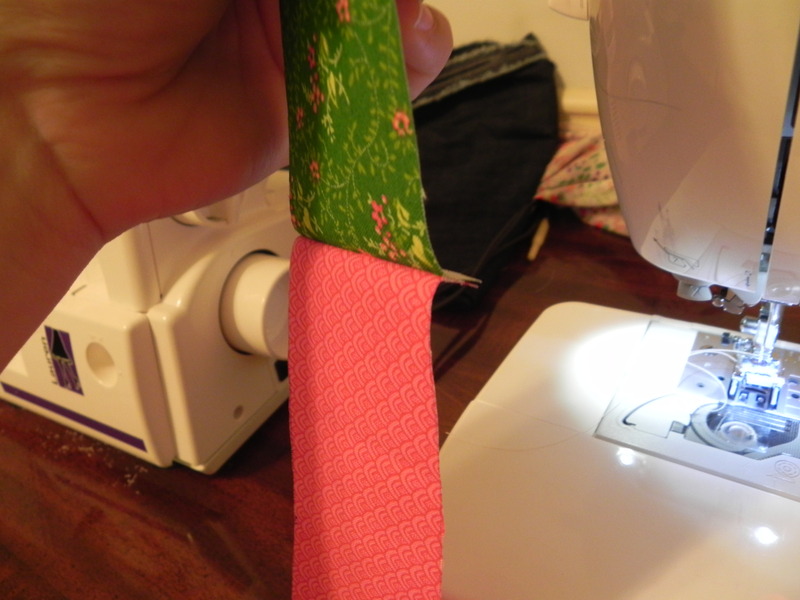 Press all the seams in your now very long 2″ strip to one direction. I usually press away from the center. You can press the in toward the center, haphazardly, open, whatever. 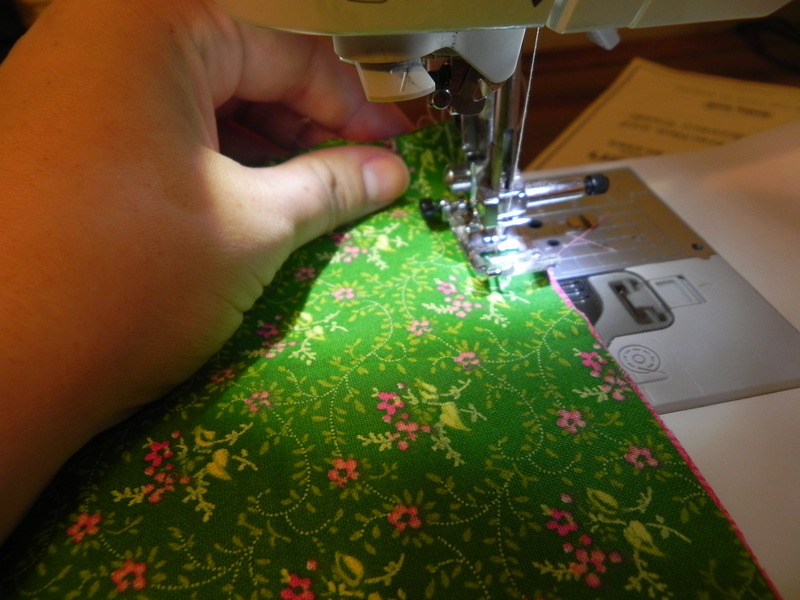 Just press the seams. 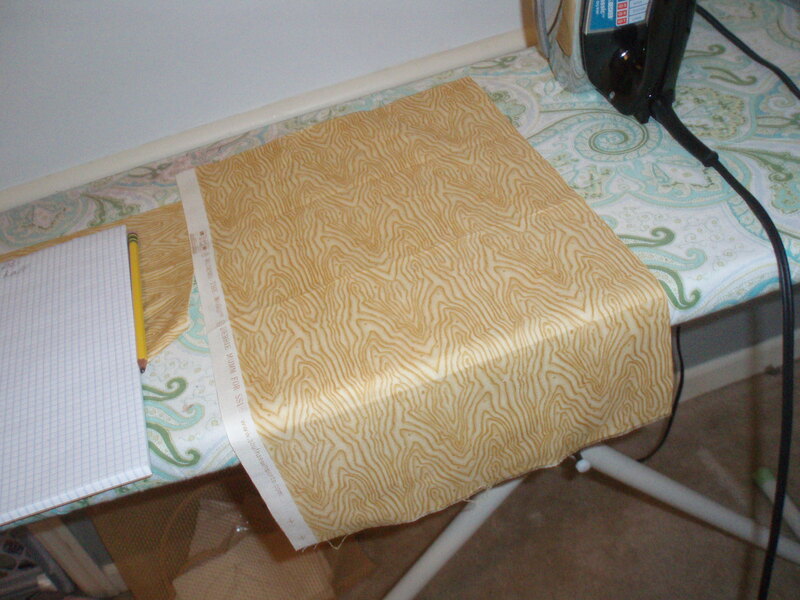 Now, press all the strip into binding. You’ll do the exact same thing you did before, just more of it. This is not a difficult process at all, it is just a process. 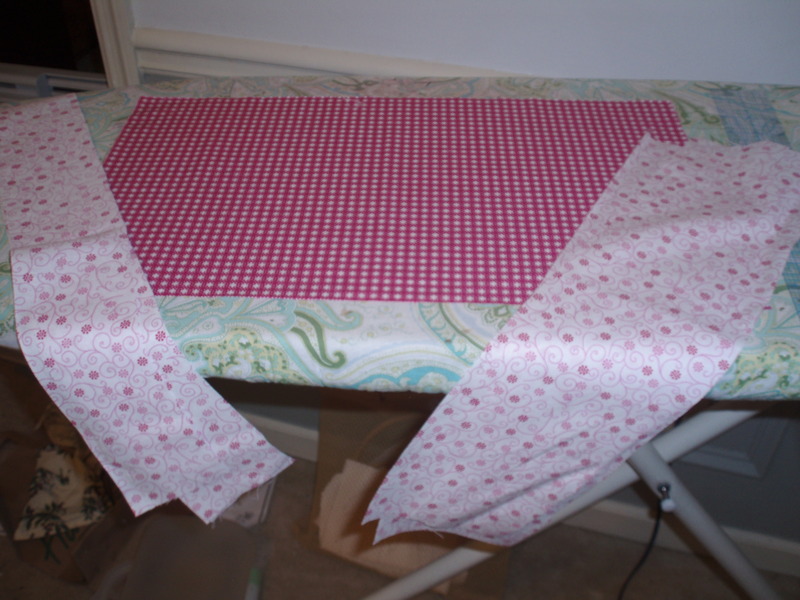 Fold in half, press. Tuck one side toward the center, press. 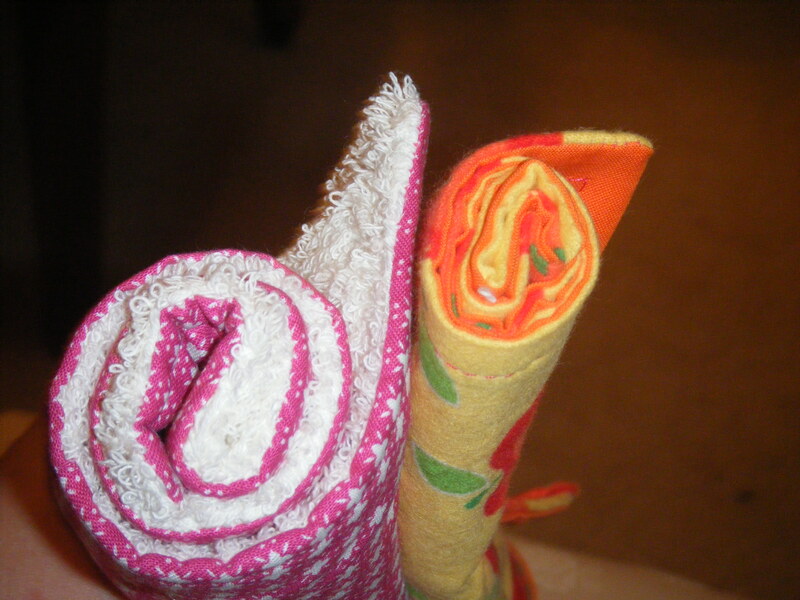 Tuck the other side toward the center, press. 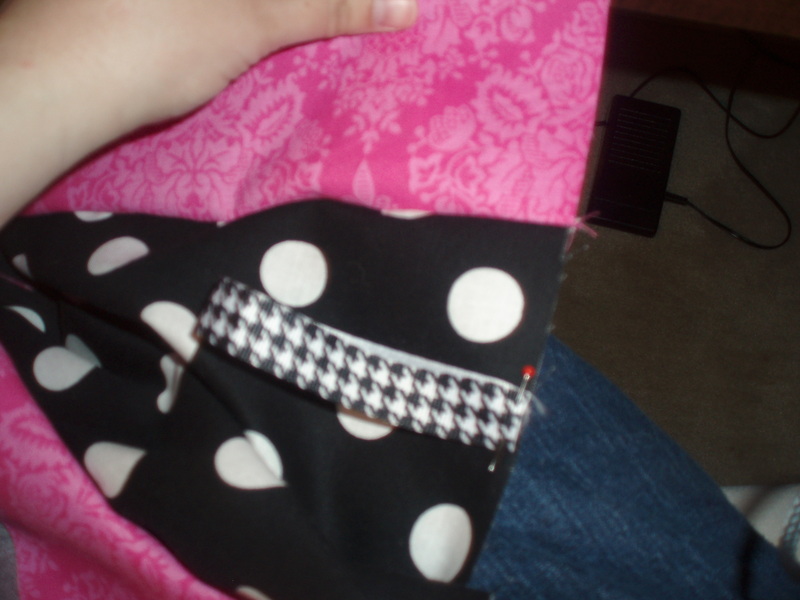 Position the center of the binding so that it makes the neck loop of the apron. I generally just eyeball this. 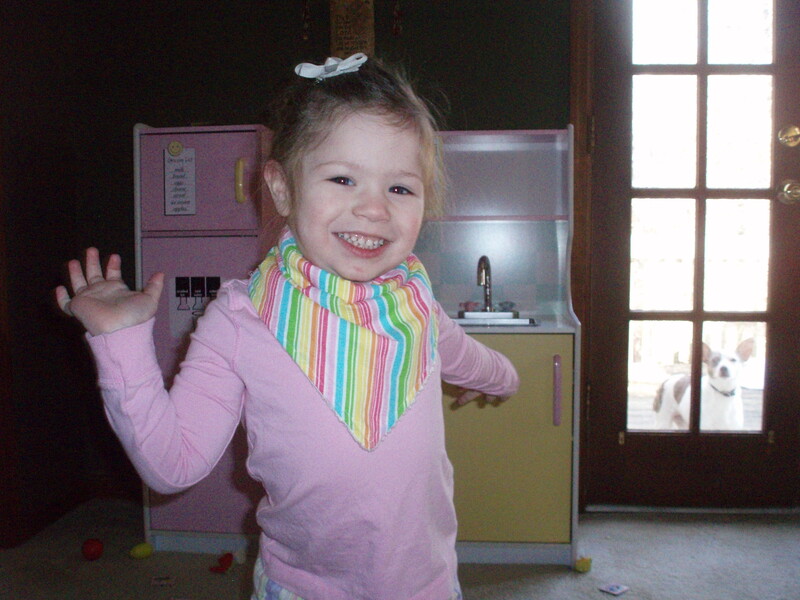 How big your neck hole needs to be really depends on the kid. 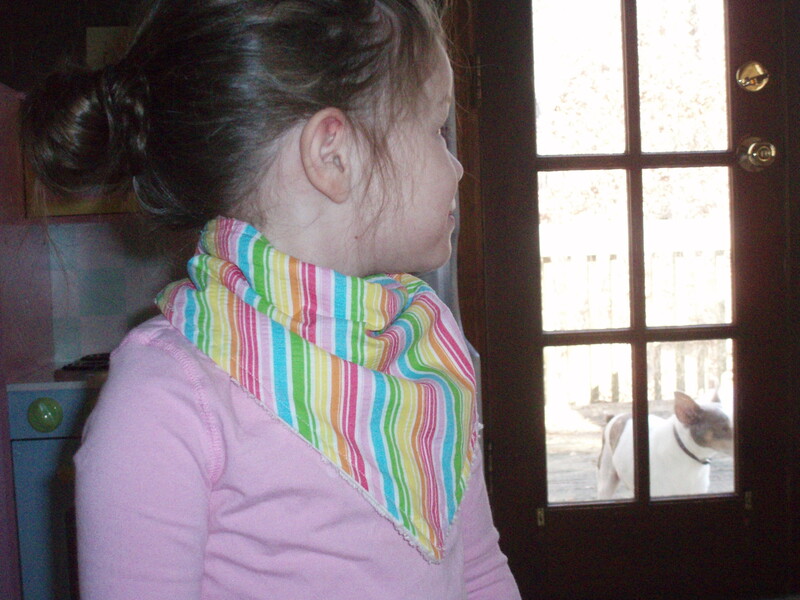 Err on the side of slightly too big, because you can always tie a knot in the neck to shorten it a bit if you need to. 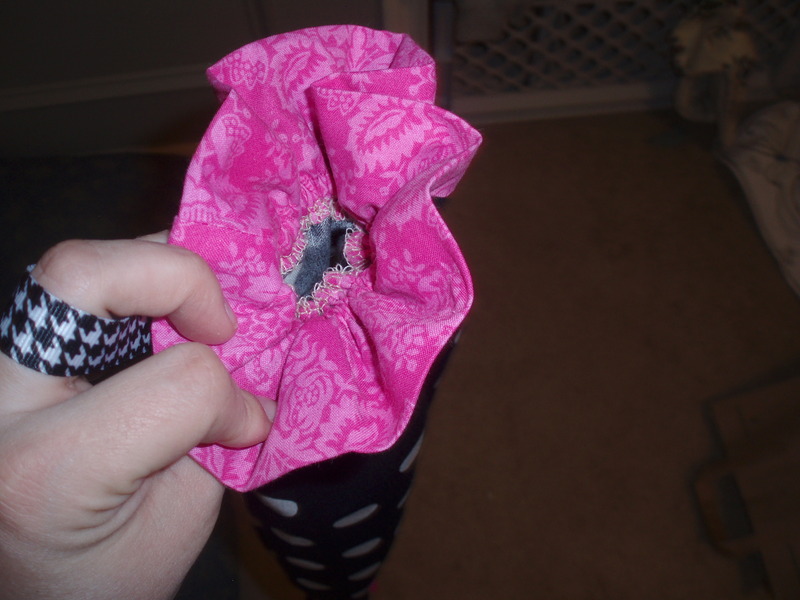 If you make it too small for a fat head, you’ll have far less options of fixing it. 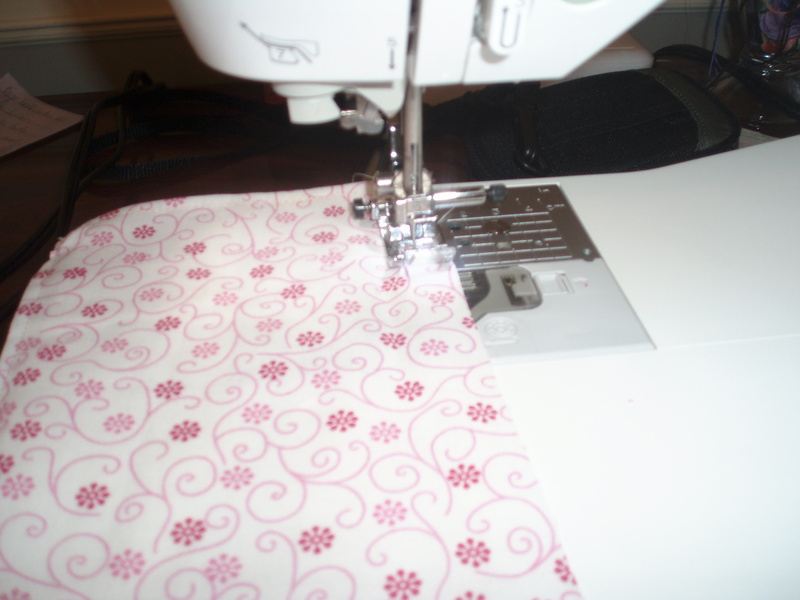 Put a pin to mark the binding where it will meet the top edge. 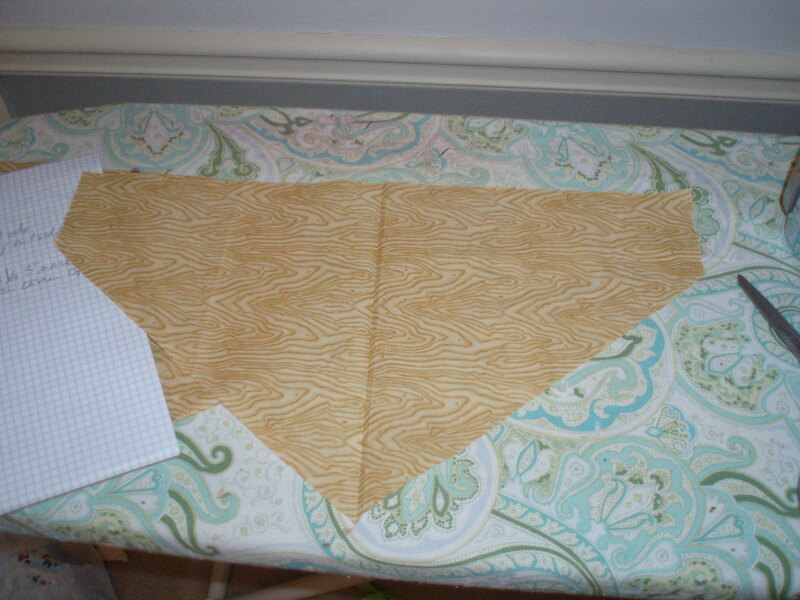 Here is where you are going to start sewing your binding on. (You’ll finish the rest of the tie on that side later.) 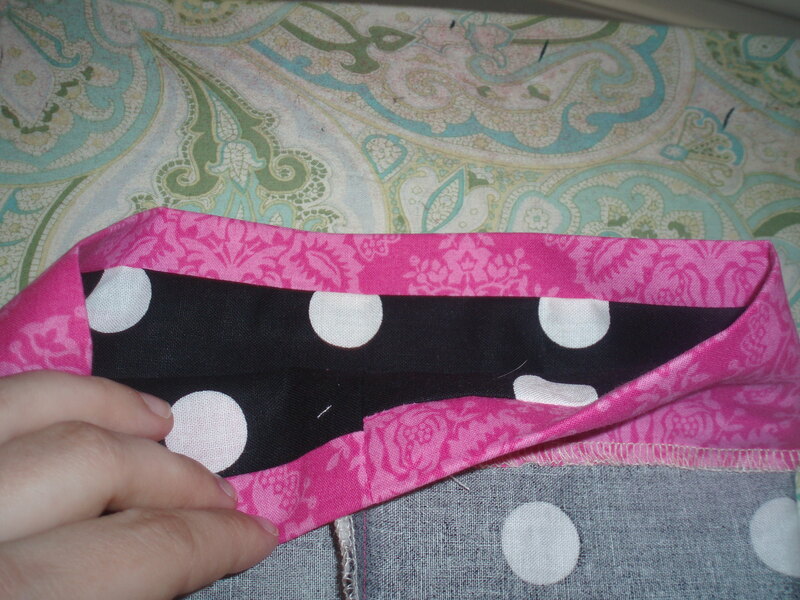 Starting at the hip, sew the binding (that is encasing your edge) to the main apron body. 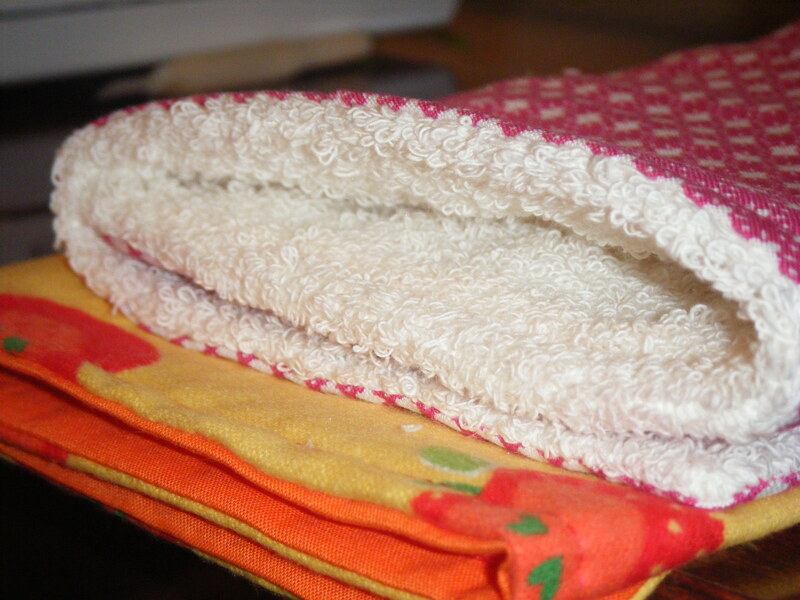 The first little bit will be a bit difficult because you’ll have quite a few layers there in that corner. 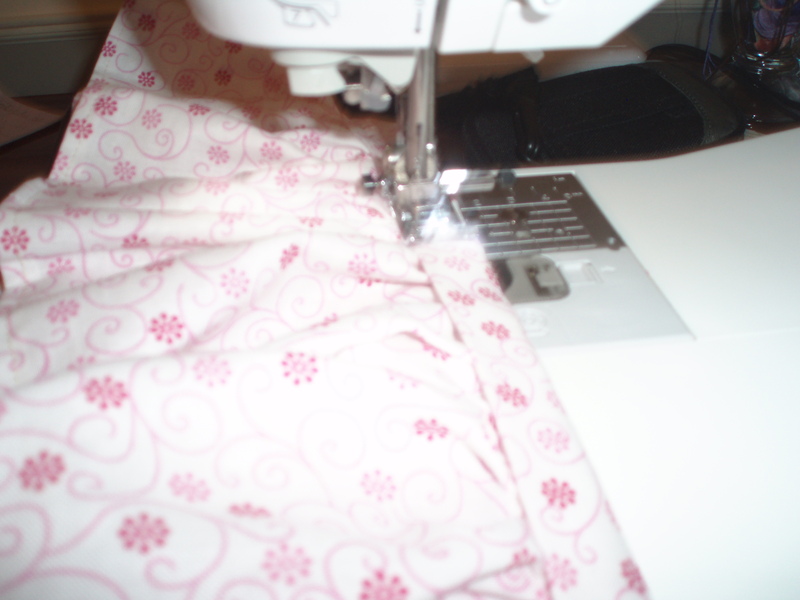 You’ll want to make sure the apron body stays within the binding. 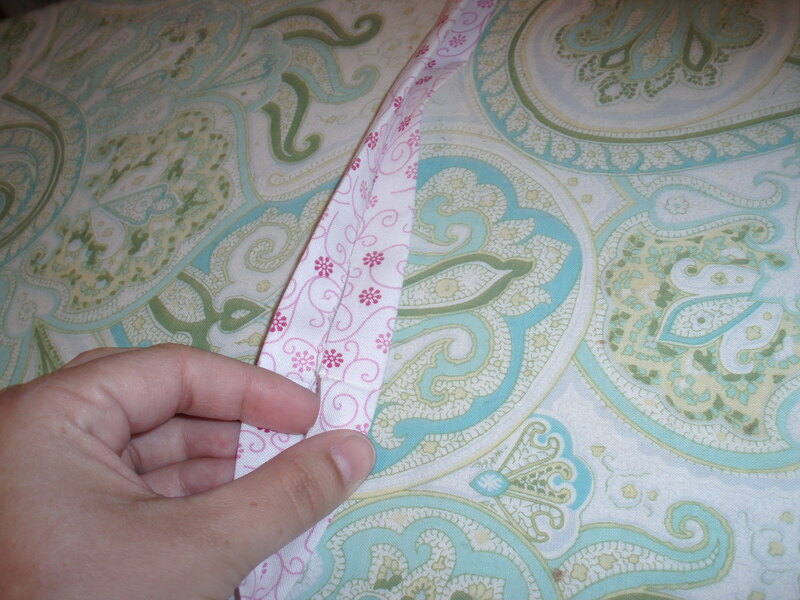 It will seem a little strange sewing binding to a curve the first time you do it, but you’ll get used to it in no time! 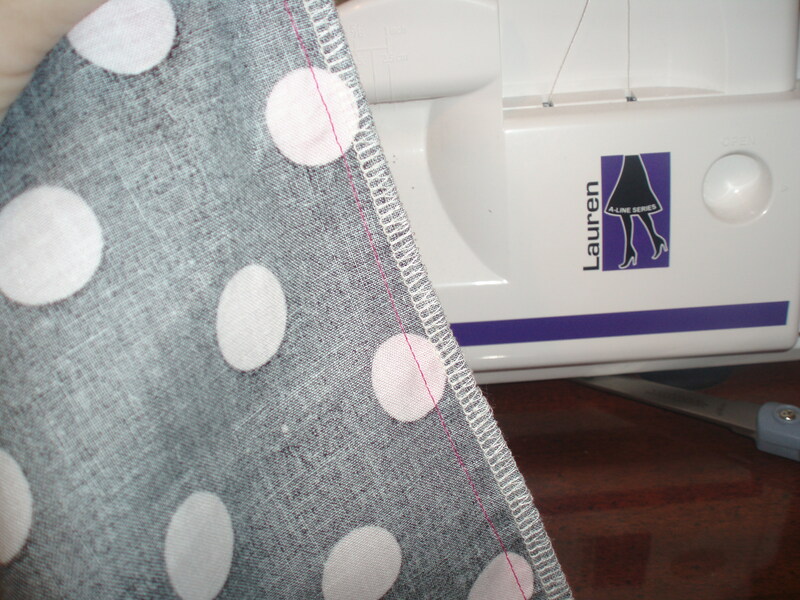 When you get to the top of that side of the apron, you’re going to keep sewing the binding, making the neck loop. 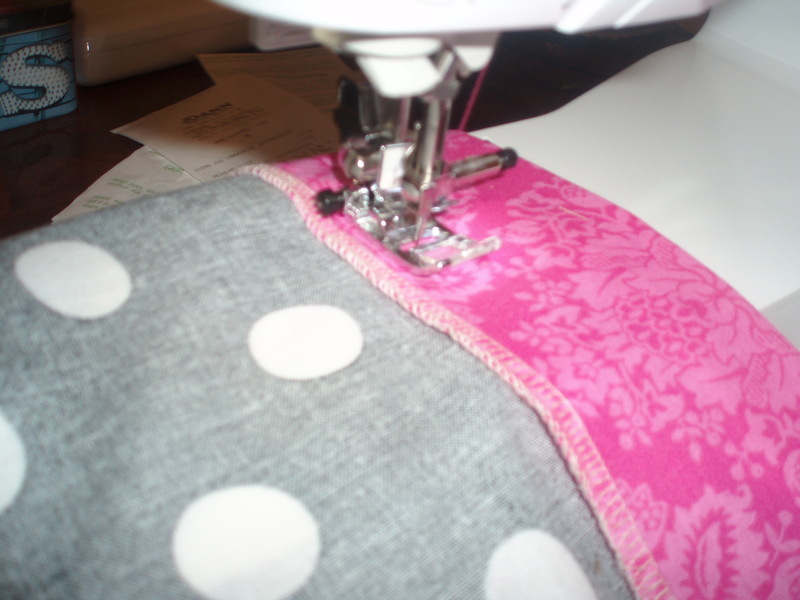 Just keep sewing until you reach your pin, then check and make sure your apron body is well inside your binding and continue sewing. 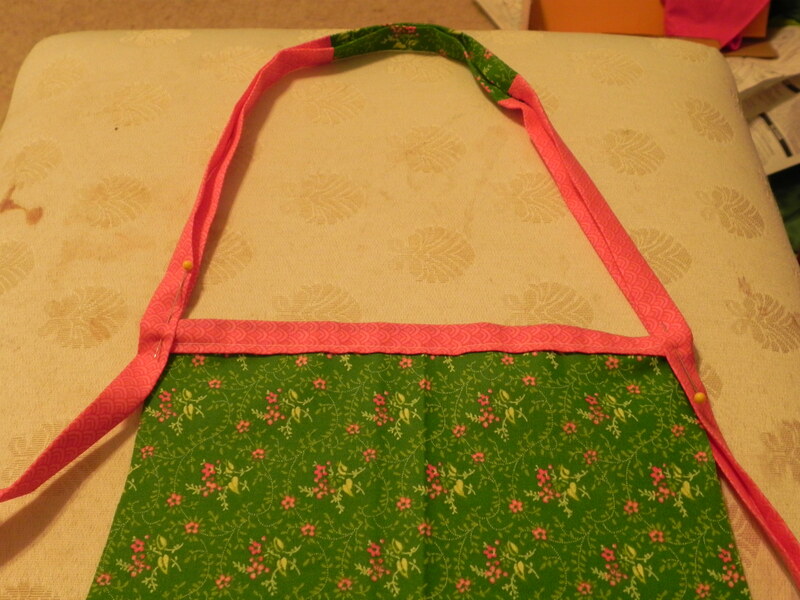 Sew down the other side of the apron. 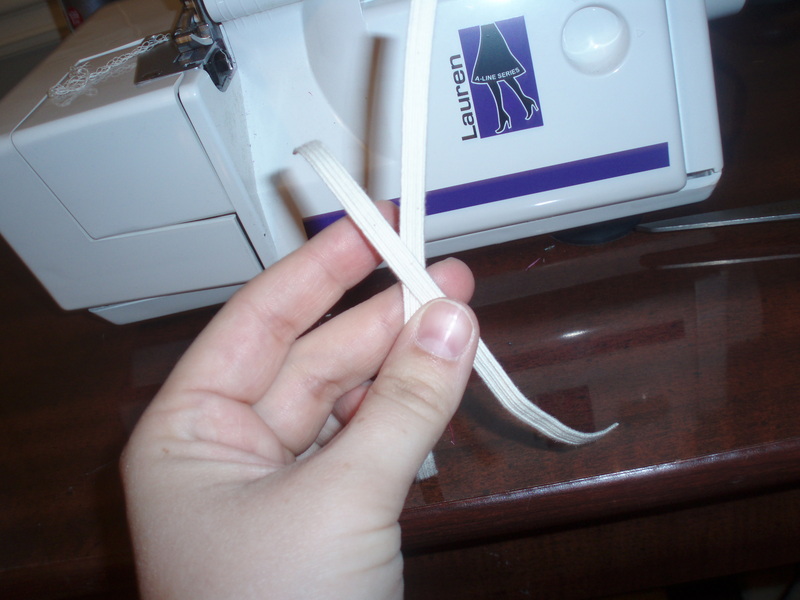 When you reach the hip on this side, keep sewing to the end of the binding. 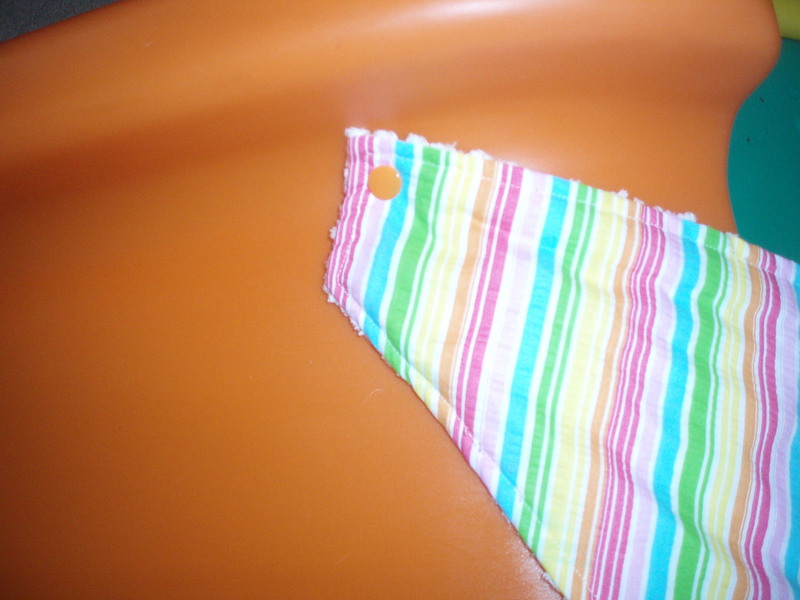 Flip your apron over, sew the binding closed on the other side, creating the tie on that side. 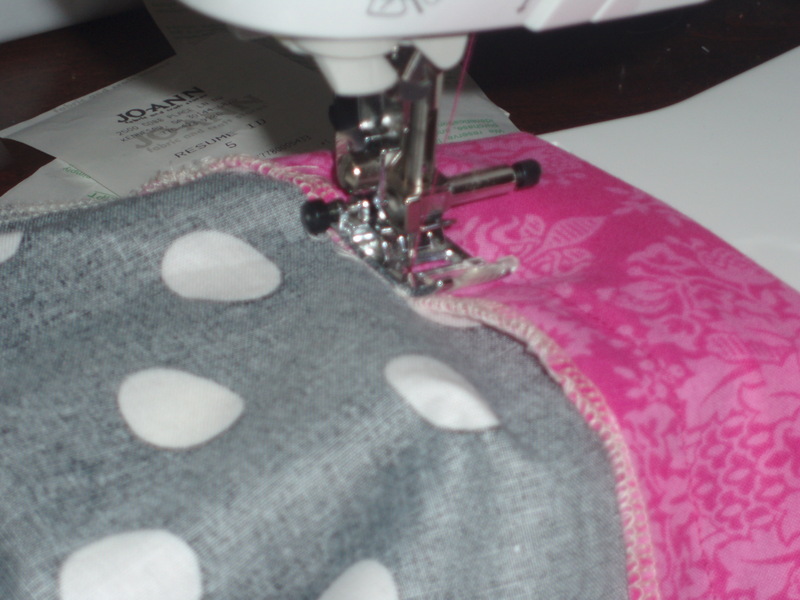 You’ll want to start about 1/2″ before your initial start place there on the hip seam, overlapping the seam a bit. 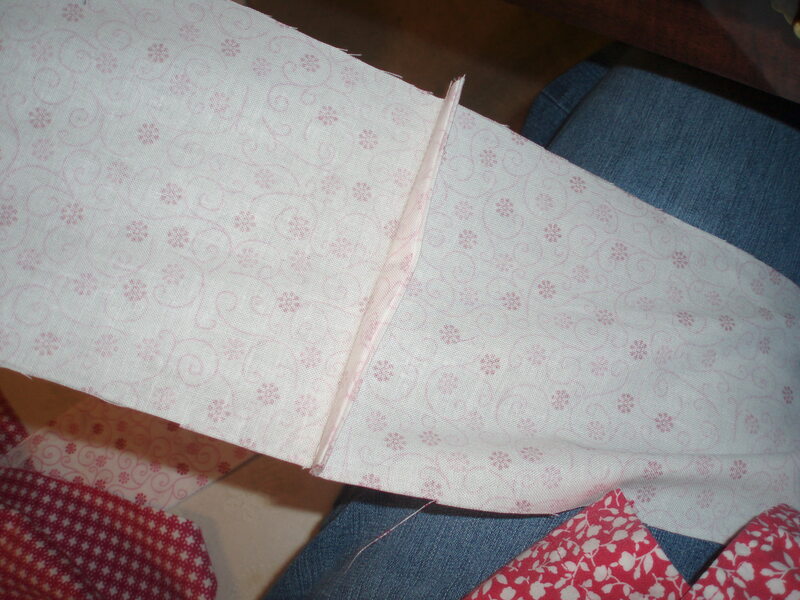 Sew to the end of the binding. 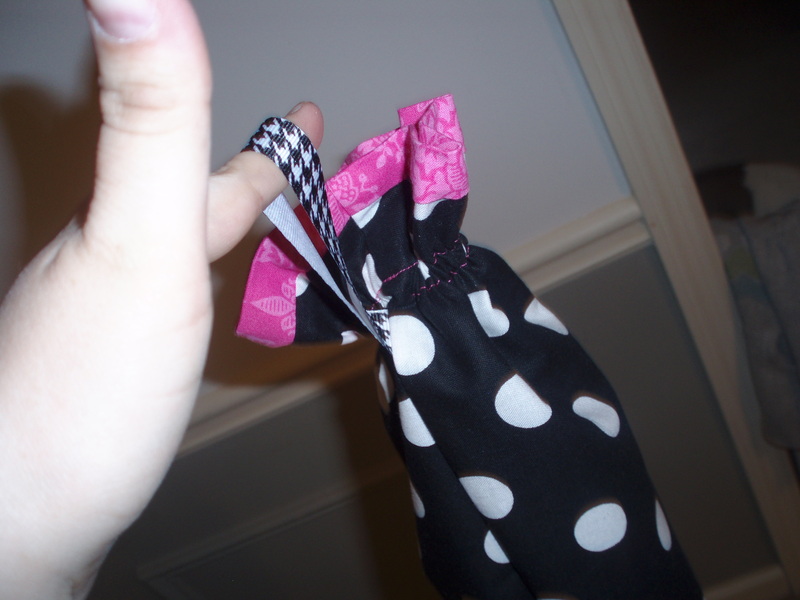 This is what your end ties will look like. 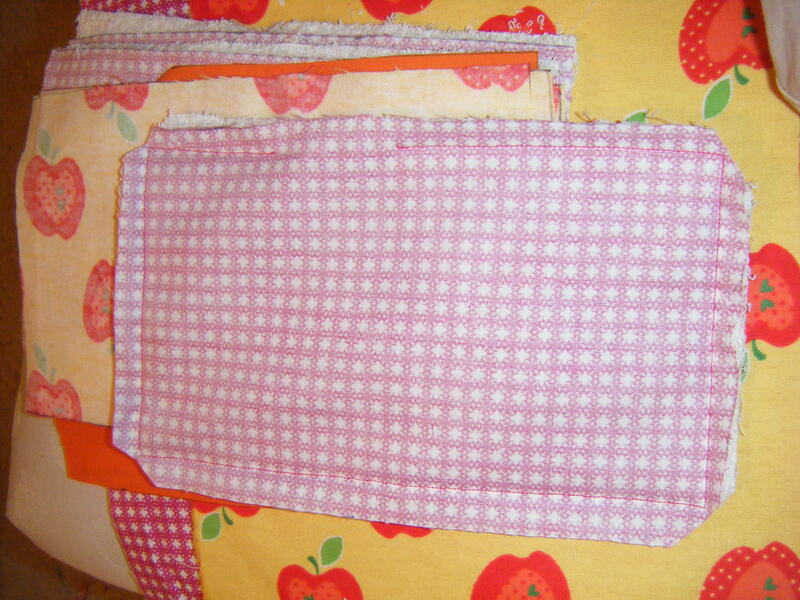 Line up the hips on your apron and cut the ties to make sure they are even. If they seem unnaturally long, you can trim them shorter. 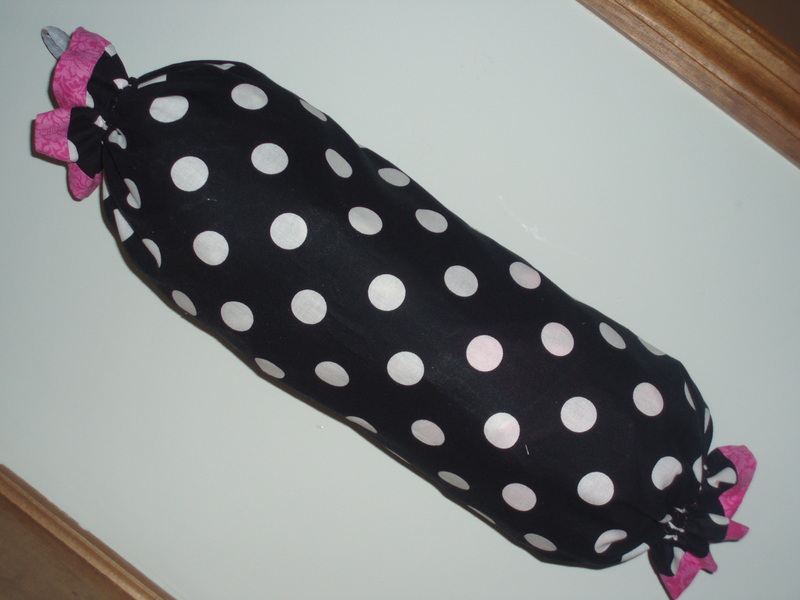 If they seem short, you can just pray it will fit around a toddler (and chances are it will). 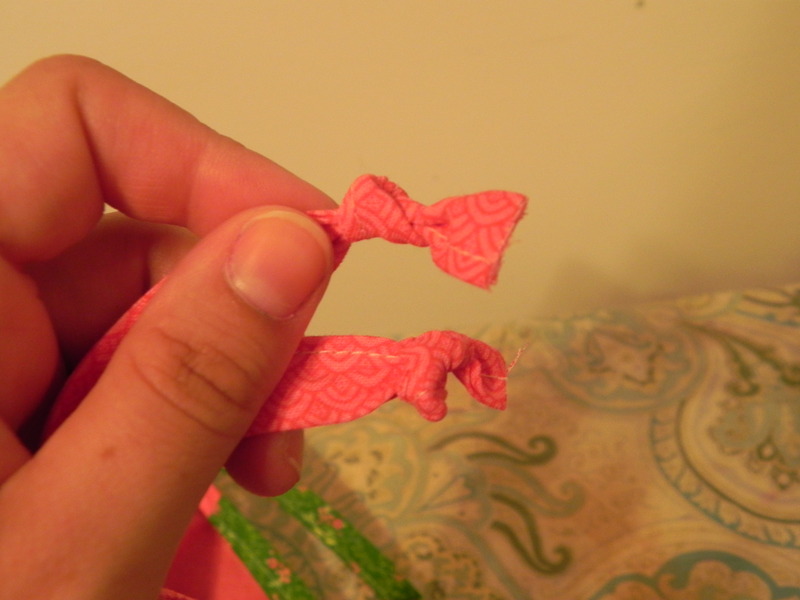 Tie a knot in each end to finish the ties. And you’re done! Clear as mud, right? Hopefully once you make it once, you’ll realize it sounds a heck of a lot more complicated than it really is. Seriously. Enjoy! 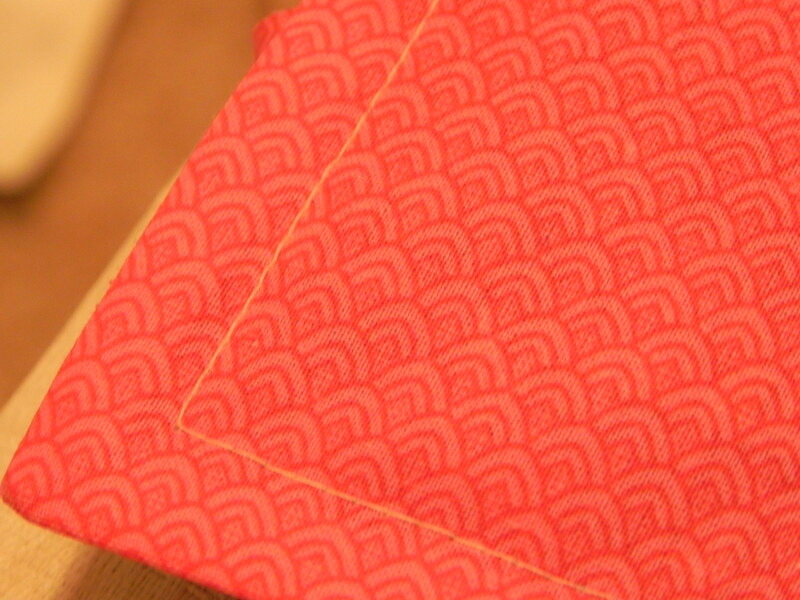 As usual, you can do what you want with this pattern. Make it for yourself, your kids, your friends, your neighbors. Sell it. Give it away. They are your skills, my friend. 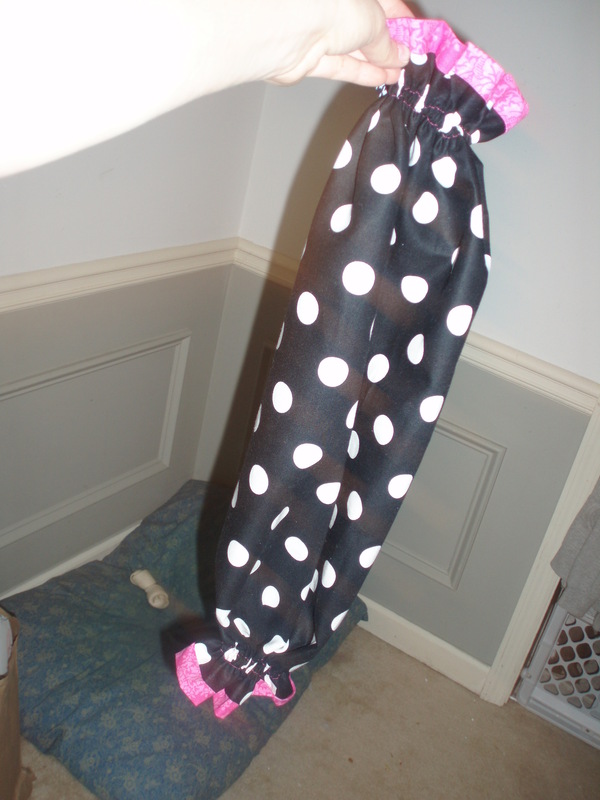 I do ask that you not take credit for the pattern and feel free to direct inquiring minds back here! Share the free. You can see a few of these (with fancy rounded corners) in my store, Moose and Wormy.